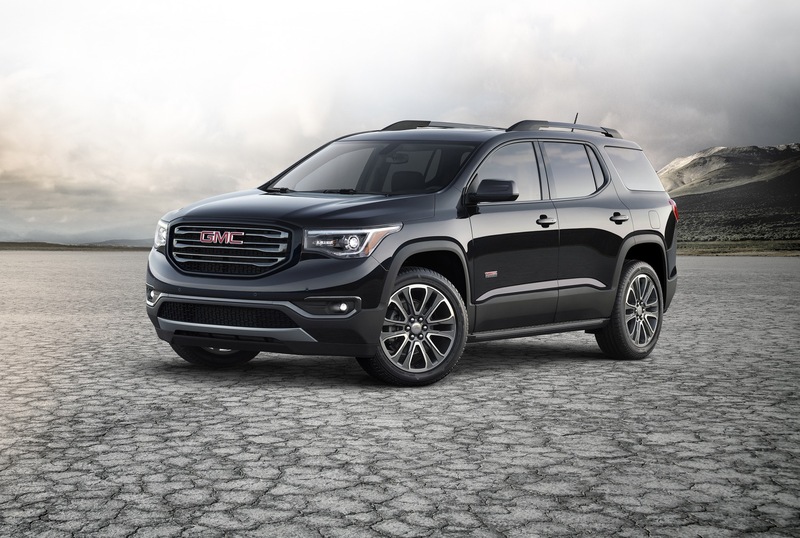 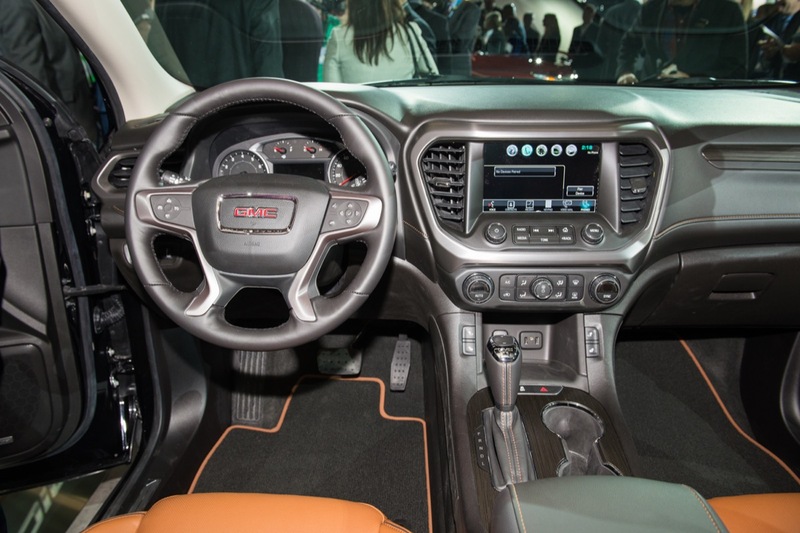 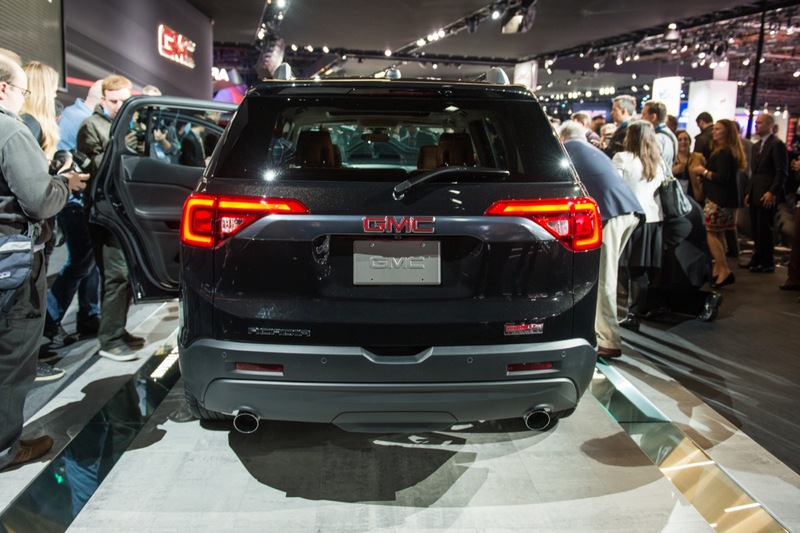 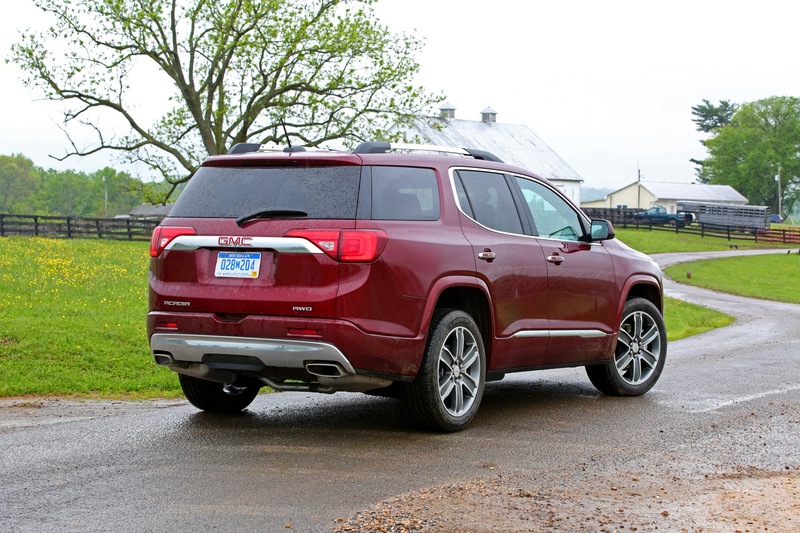 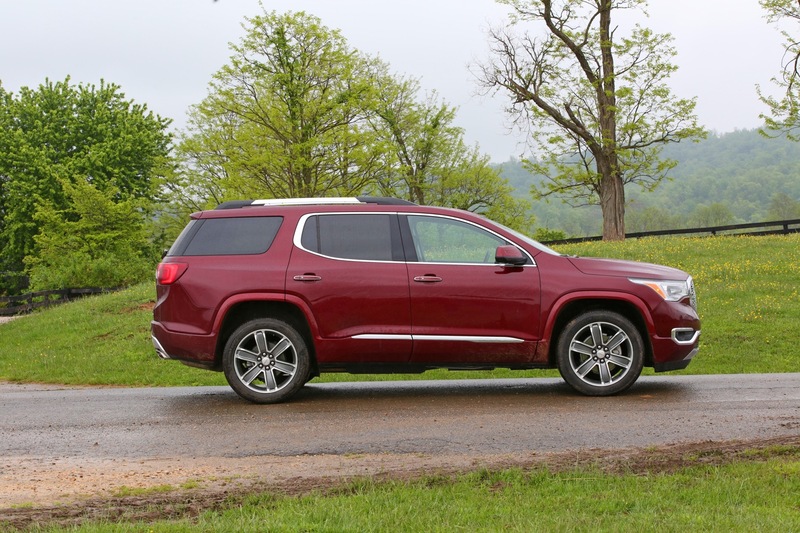 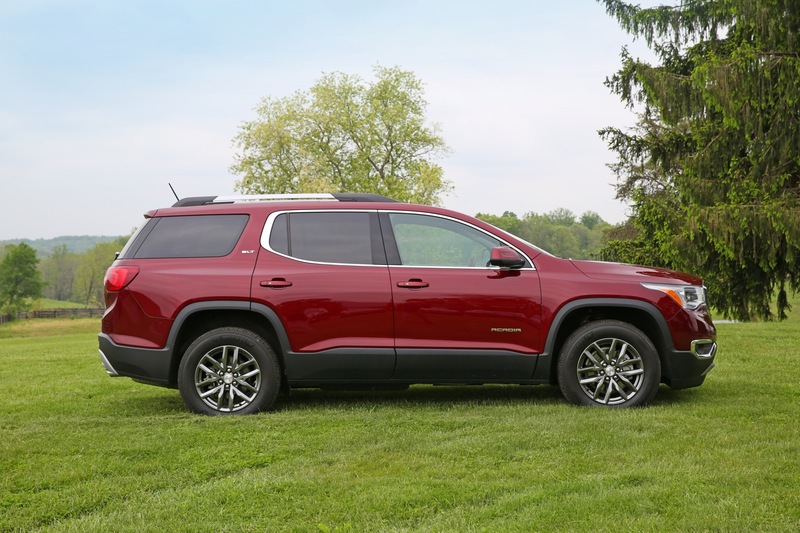 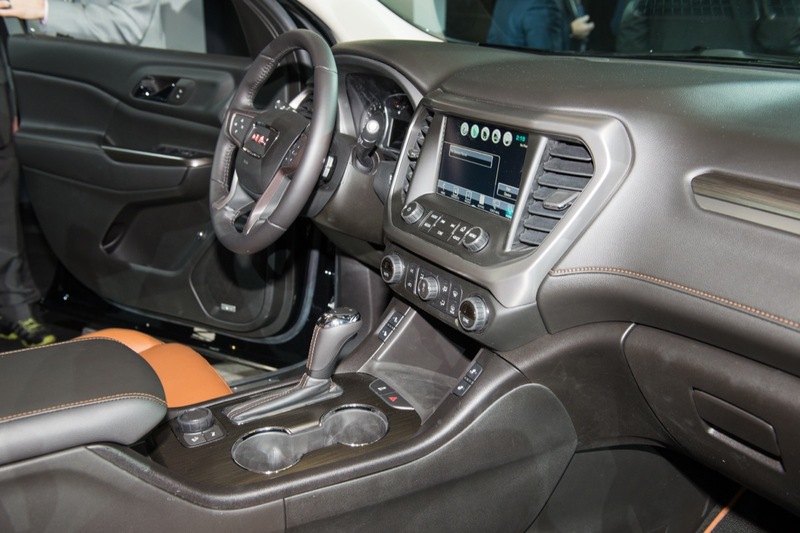 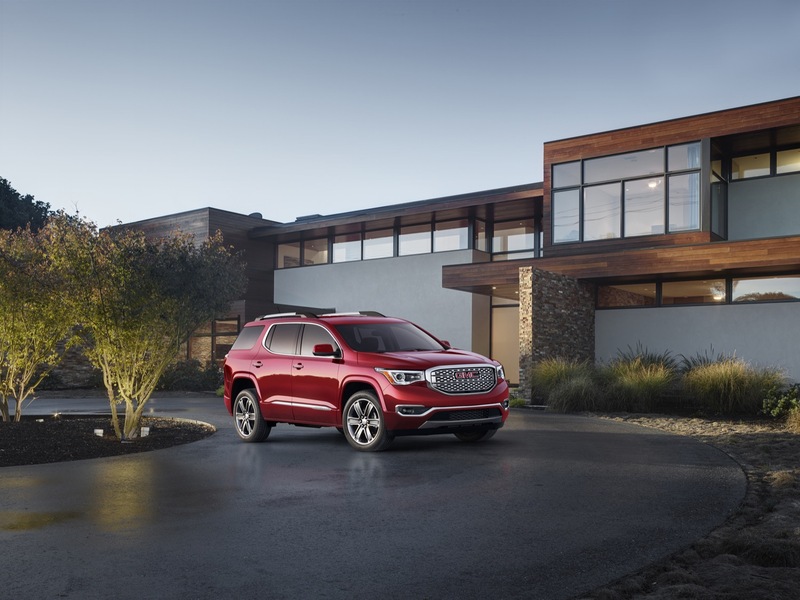 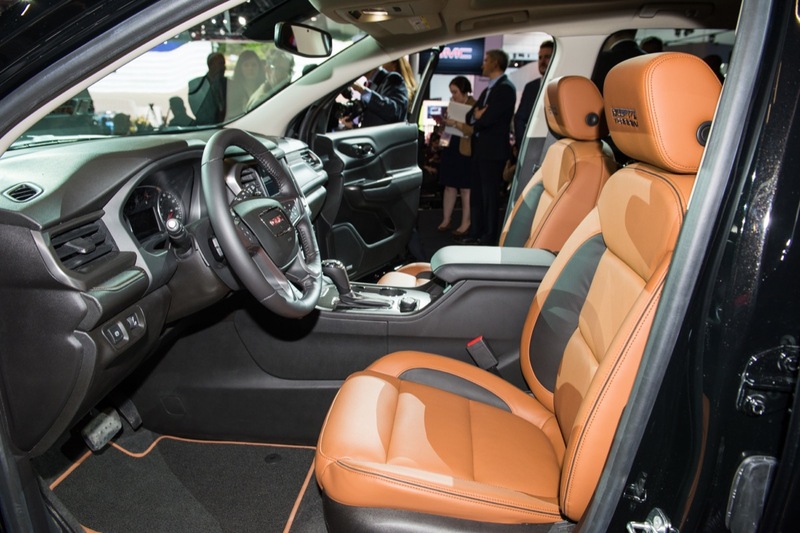 The 2017 GMC Acadia shrinks from full-size to mid-size proportions, delivers notable weight savings (to the tune of 700 pounds), and introduces the All Terrain package to the Acadia nameplate. 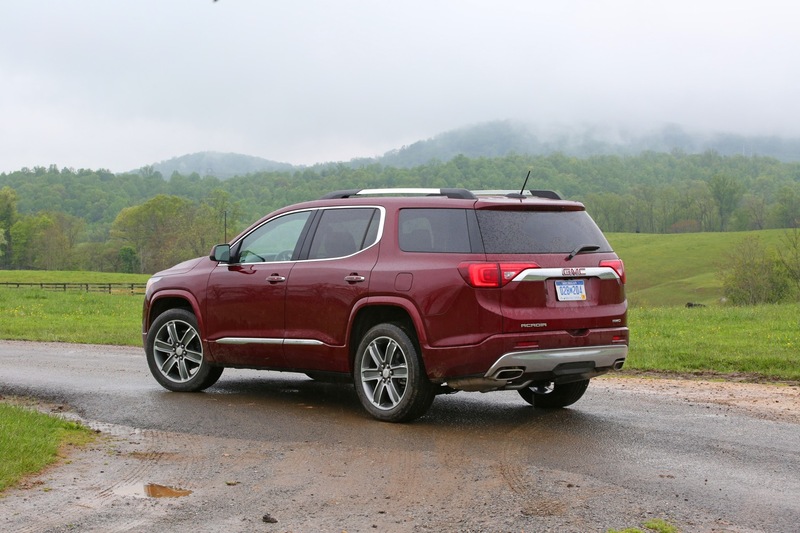 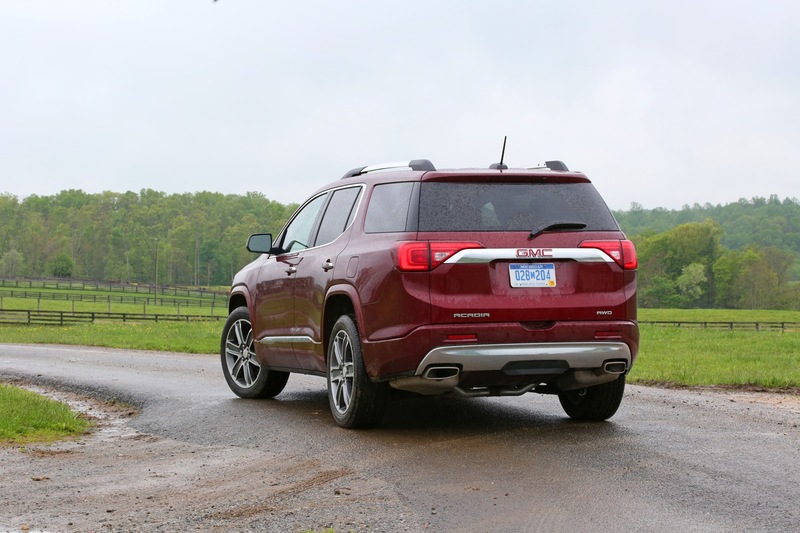 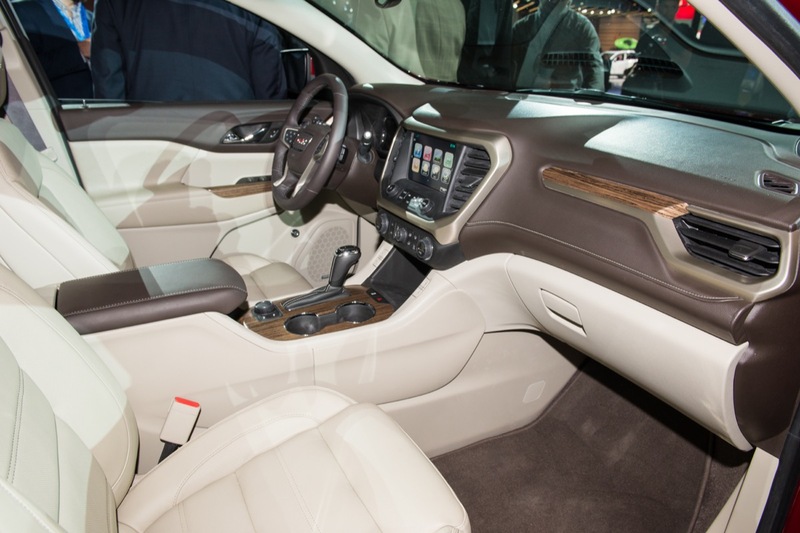 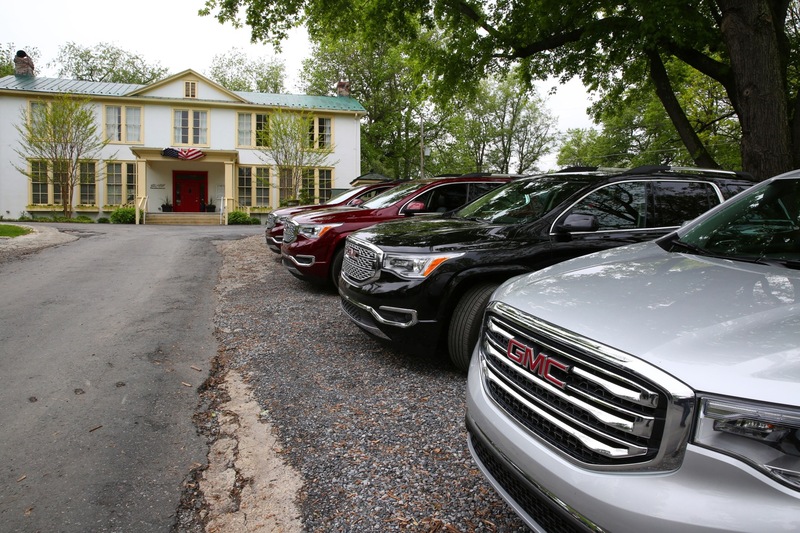 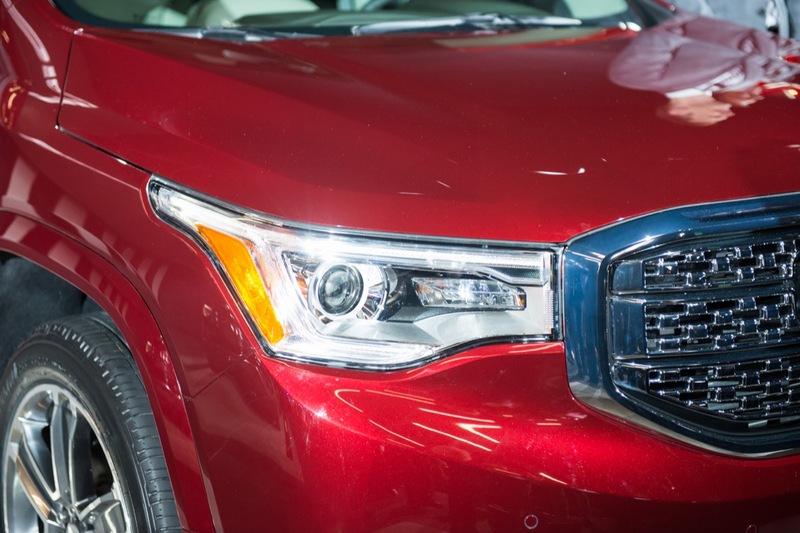 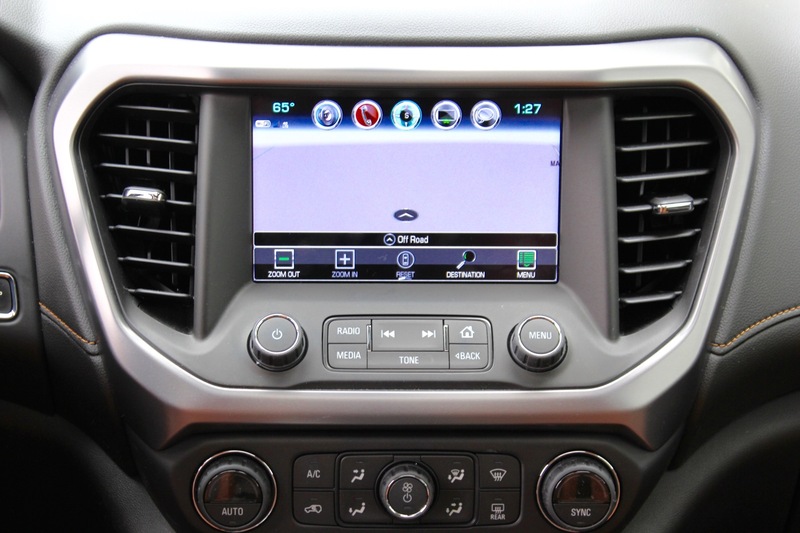 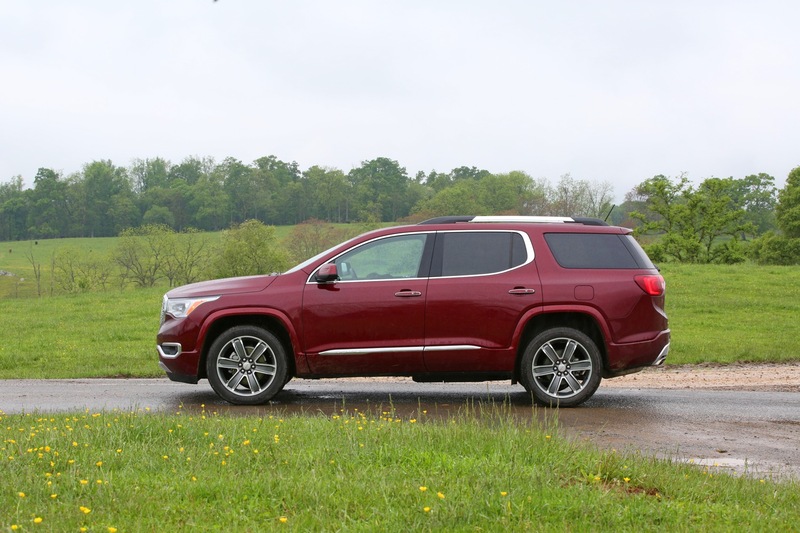 But what, exactly, is the 2017 GMC Acadia all about? 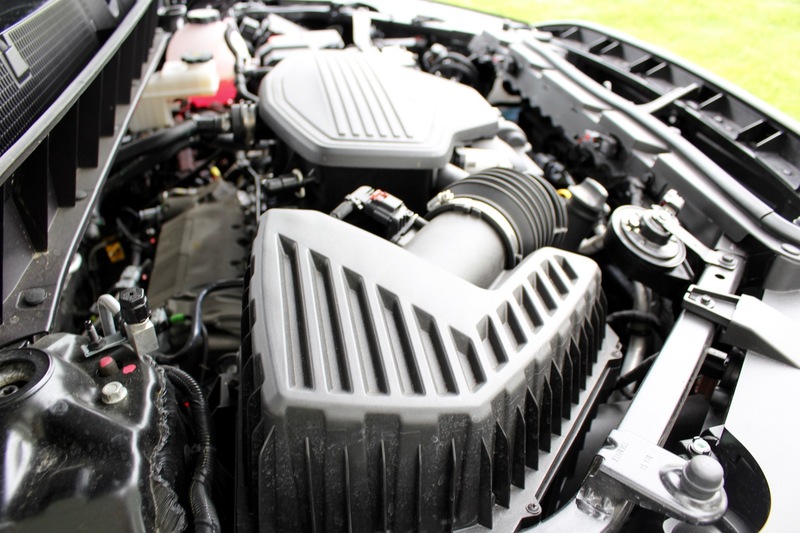 Quite a bit. 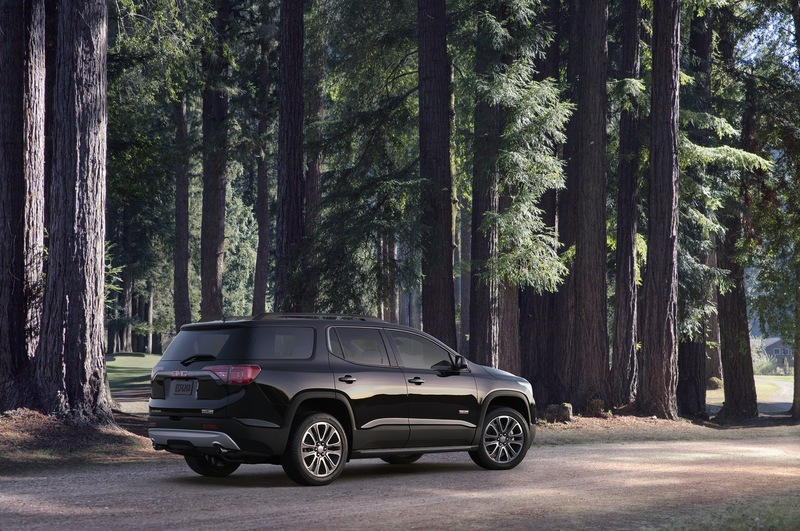 The 2017 GMC Acadia All Terrain matches distinctive exterior design elements with enhanced off-road-driving capability. 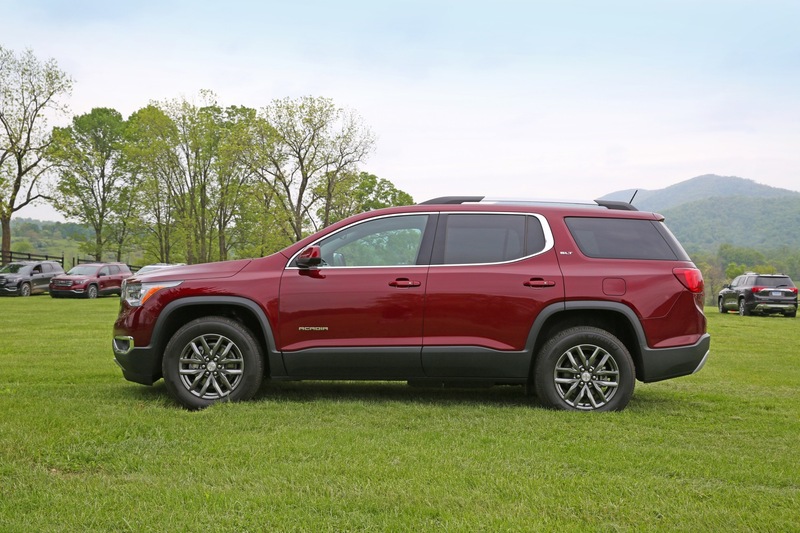 Assigned (free-flow) RPO code GAT, the package is only available with the SLT-1 trim level and offers the following equipment. 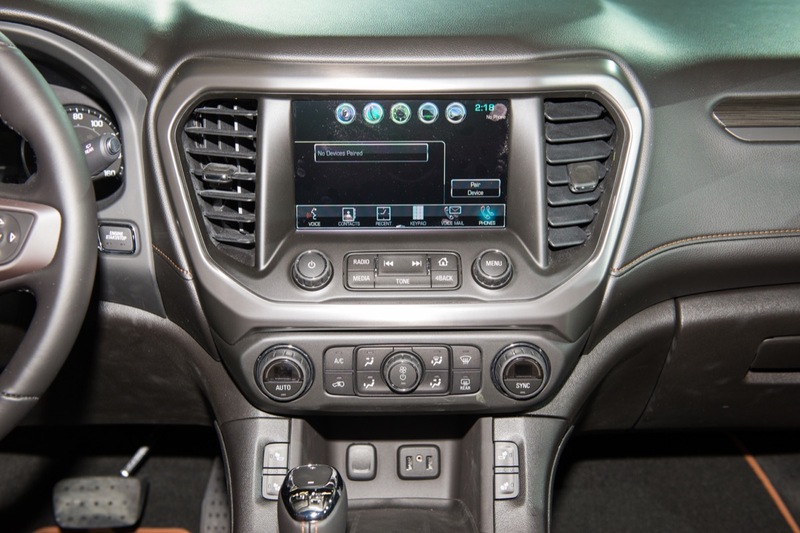 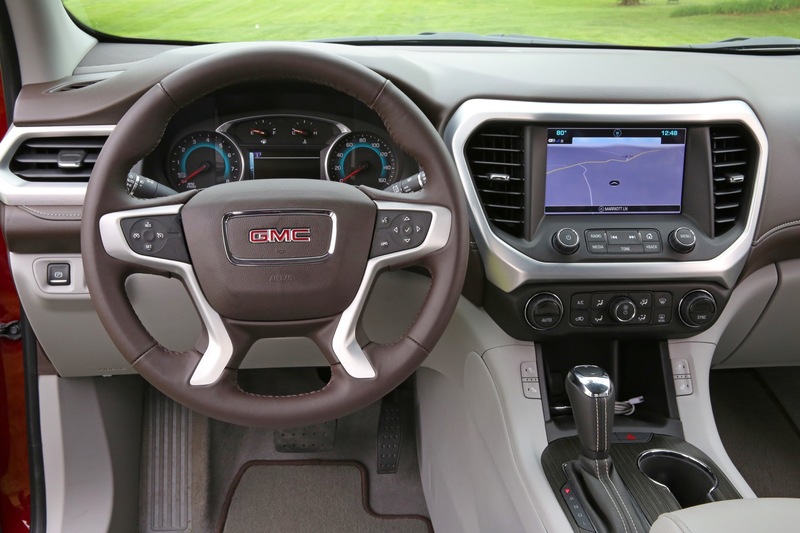 The Acadia All Terrain also features an advanced Active Twin Clutch AWD system (G99) that optimizes traction for every condition it encounters. 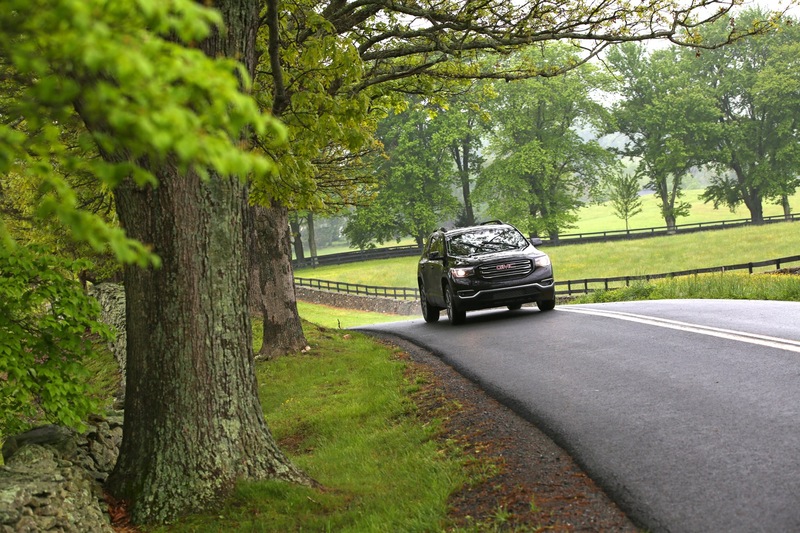 While it is engineered for optimal performance in wet, snowy and icy conditions, it also provides enhanced stability in dry conditions. 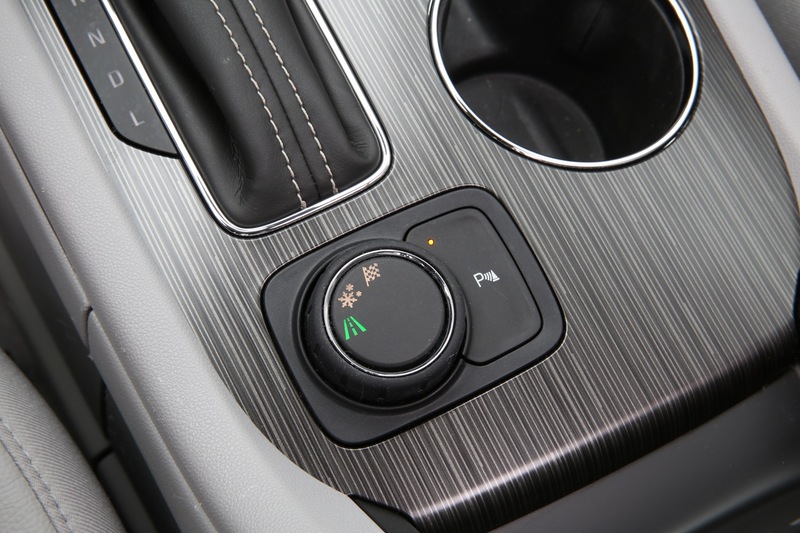 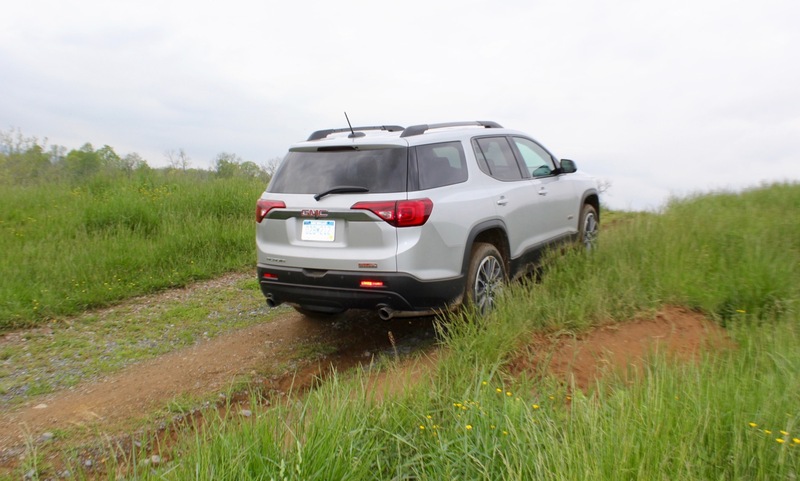 The system also has a specific All Terrain mode in place of the Off Road mode on the drive mode selector that works with the model’s exclusive AWD system to offer enhanced hill-climb capability, while also featuring Hill Descent Control (JHD). 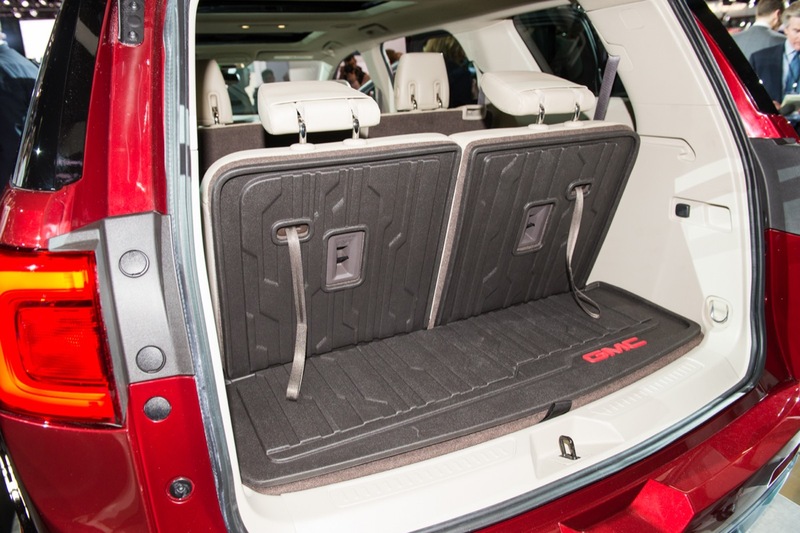 The All Terrain Cargo Package requires the vehicle to be equipped with the All Terrain package. 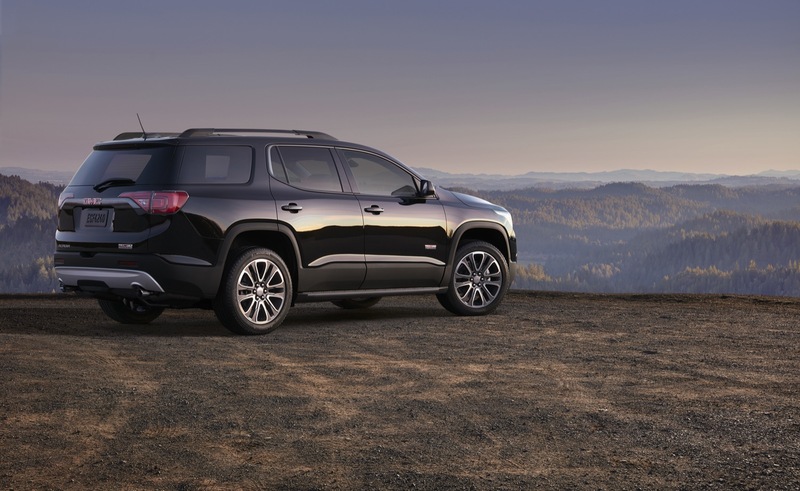 The 2017 GMC Acadia All Terrain in SLT-1 trim has an MSRP of $40,040, including a destination charge of $925 but excluding tax, title, license, dealer fees, and optional equipment. 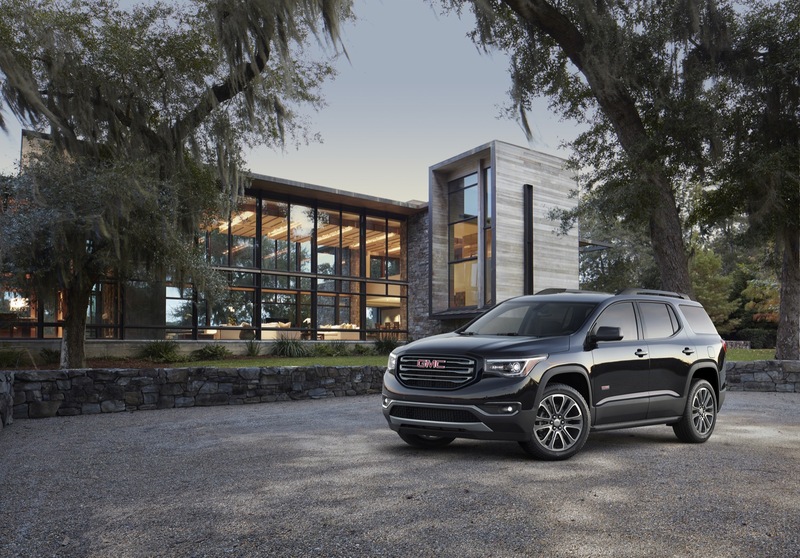 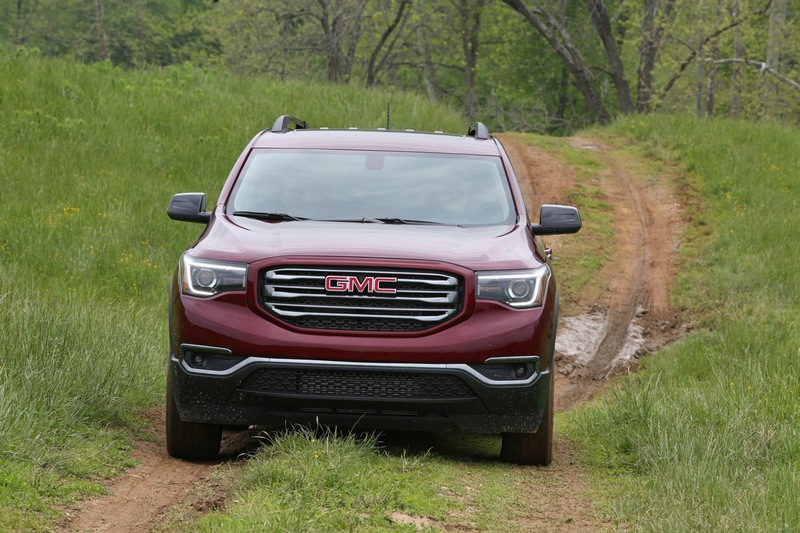 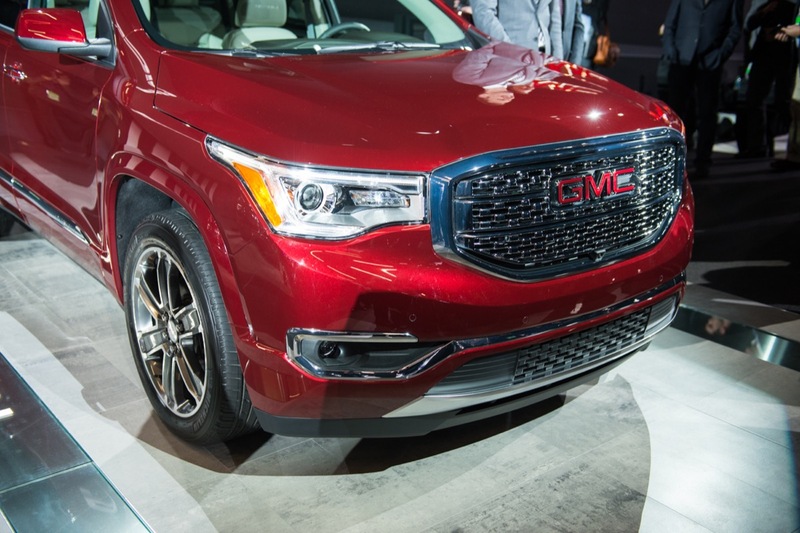 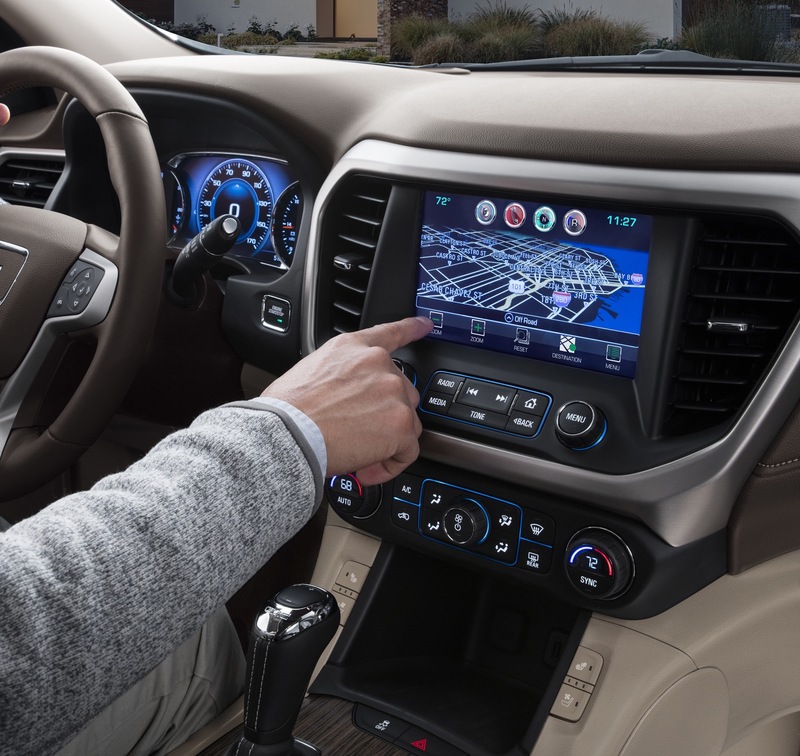 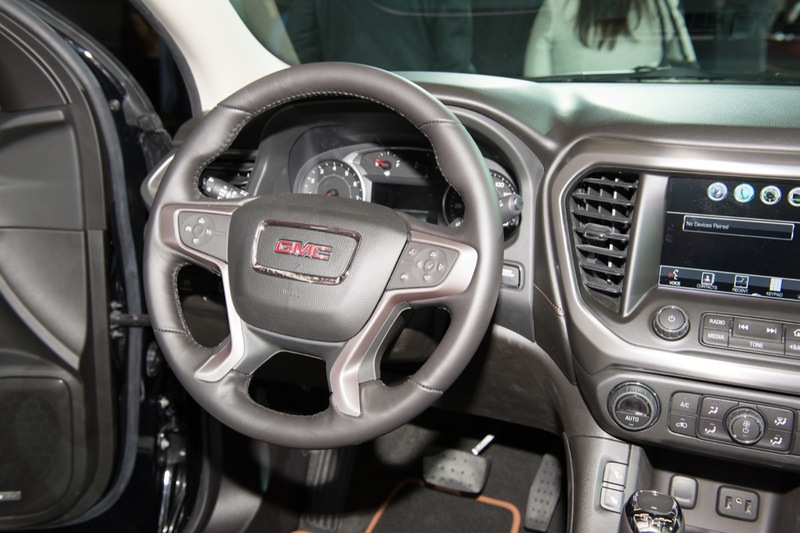 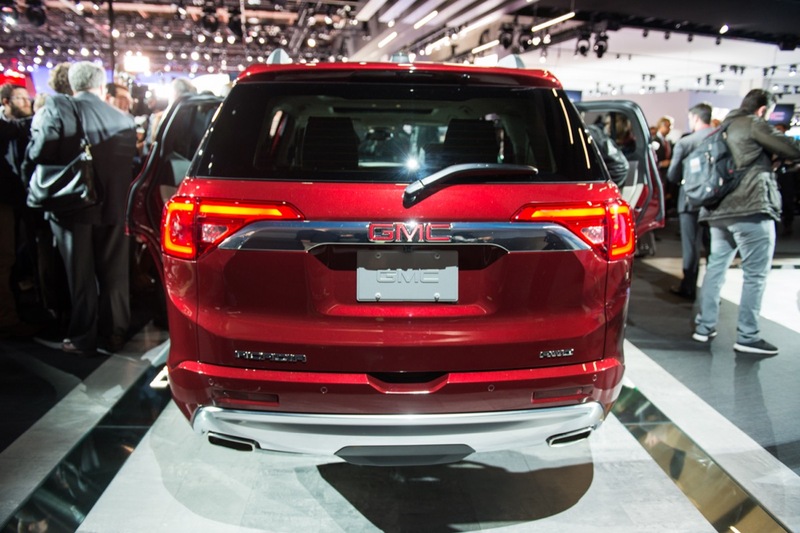 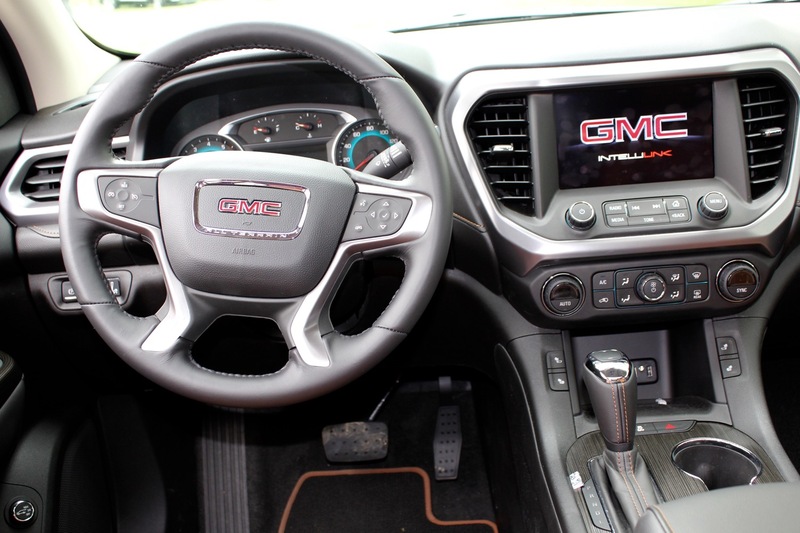 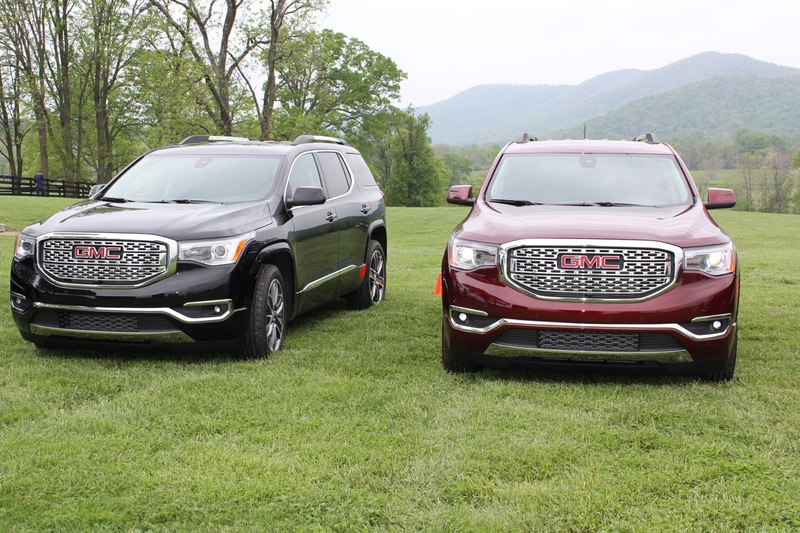 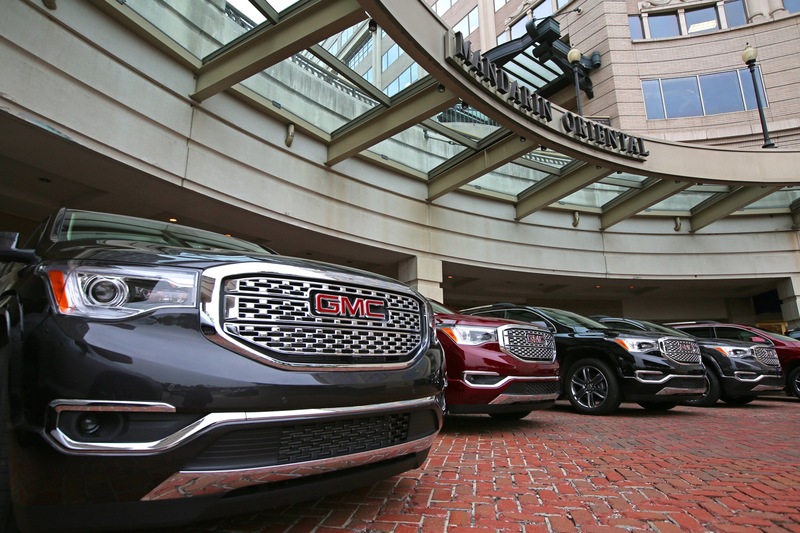 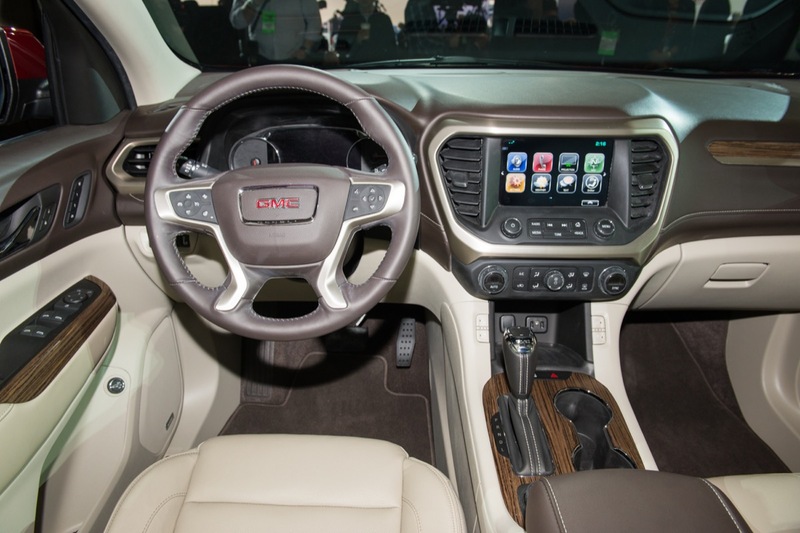 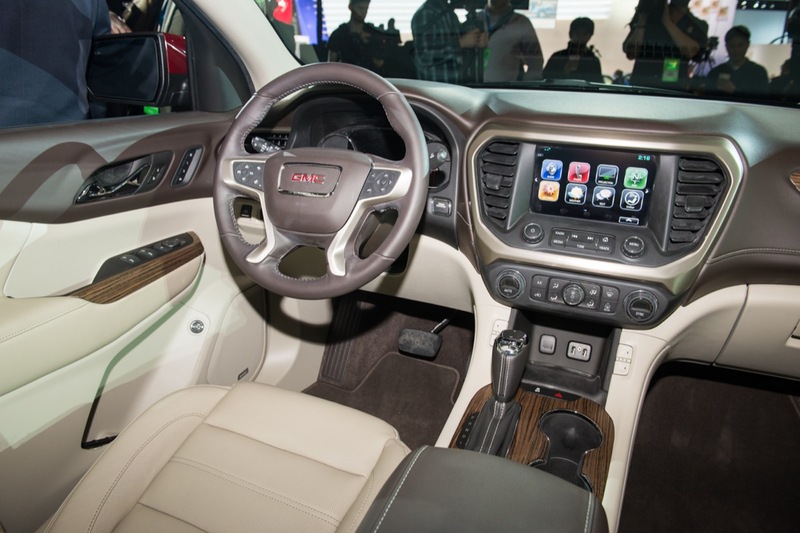 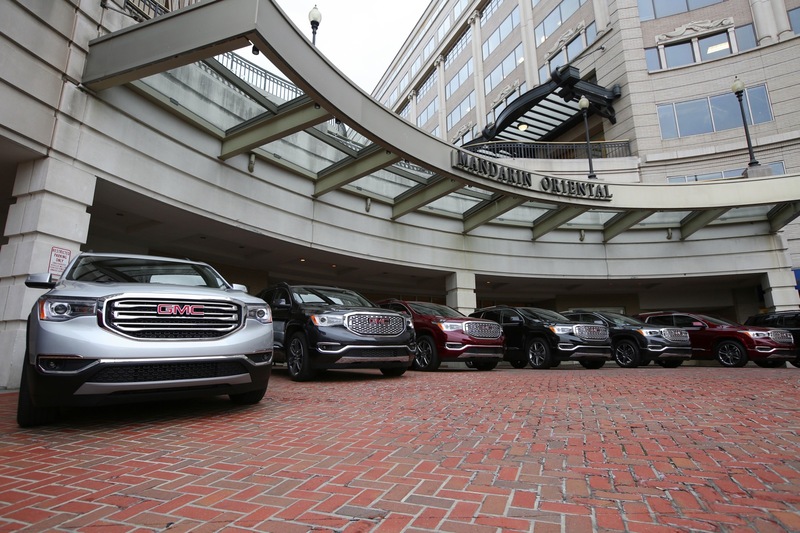 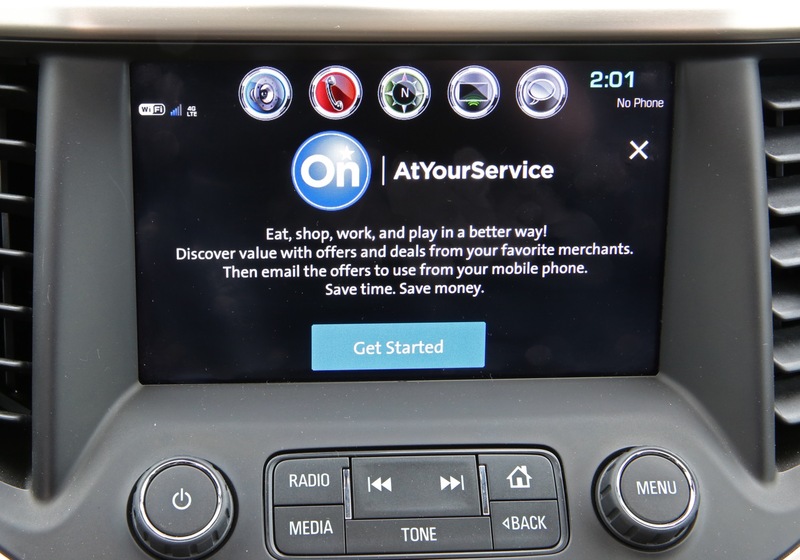 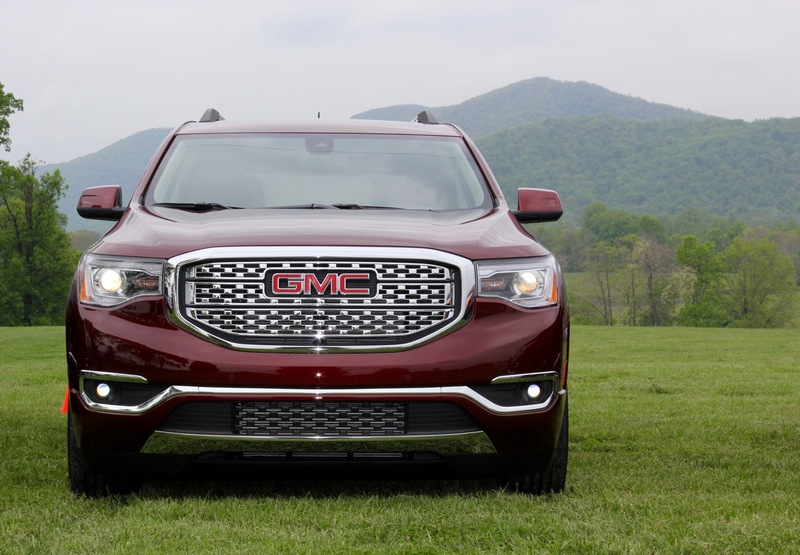 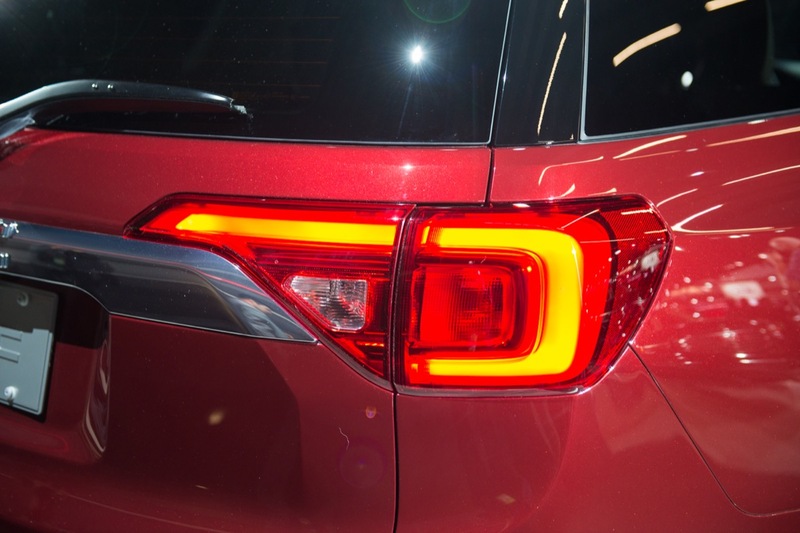 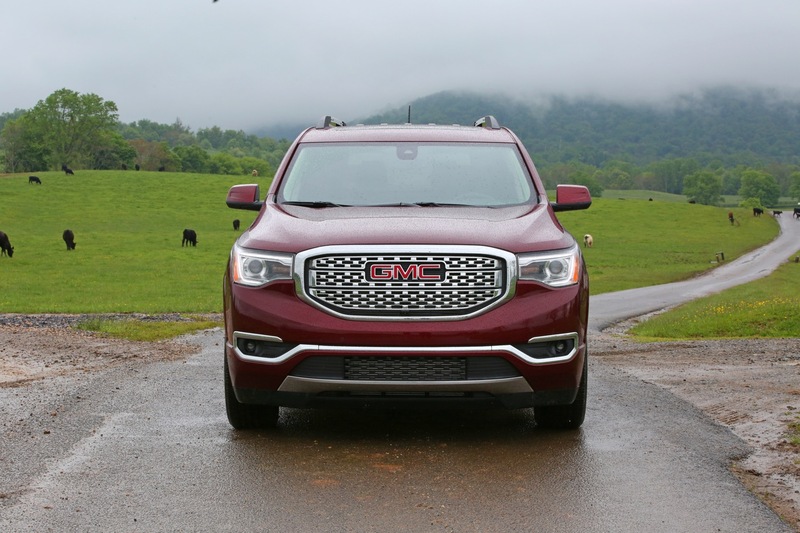 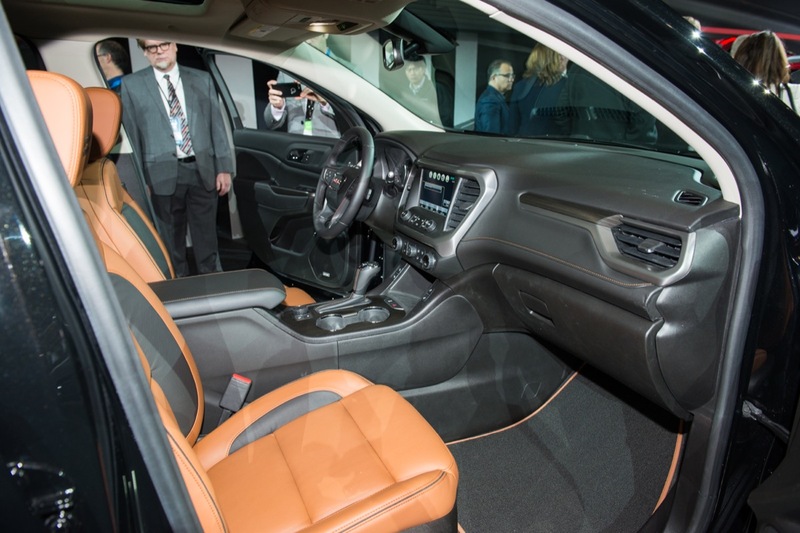 In addition, GMC has announced that it will offer the All Terrain package on the Acadia with the SLE trim level some time in the Spring of 2016. 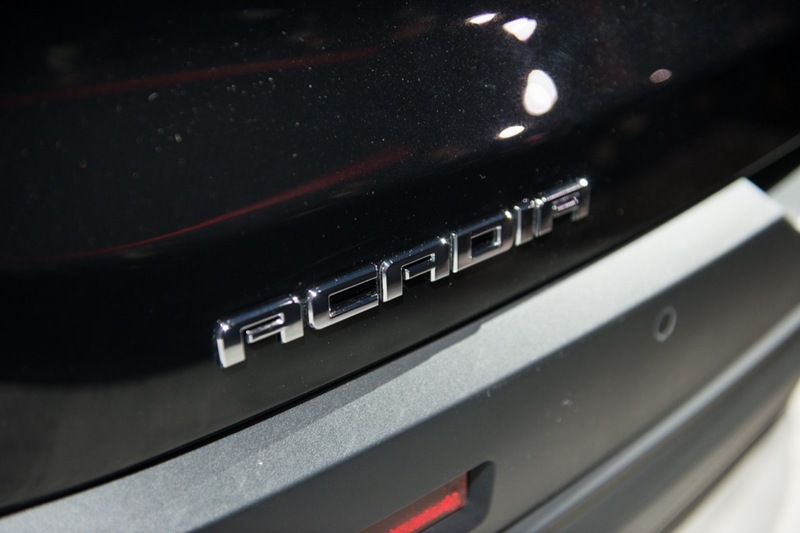 An Acadia SLE All Terrain should carry a lower starting price than the higher-end Acadia SLT All Terrain. 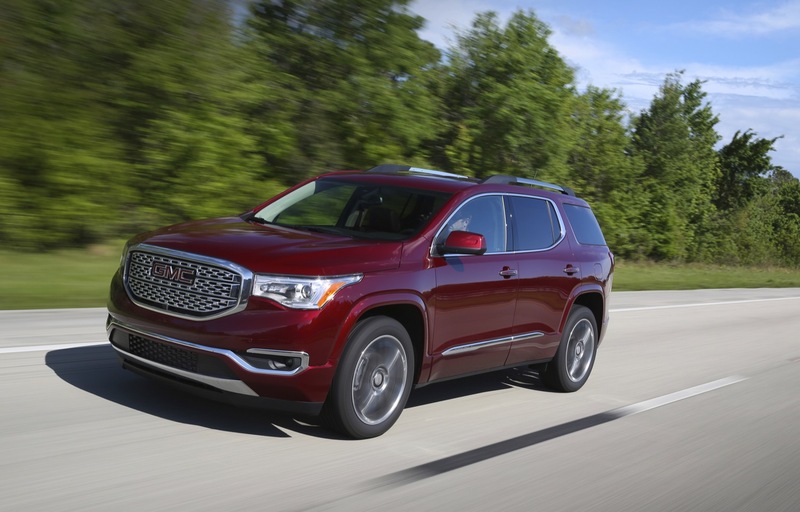 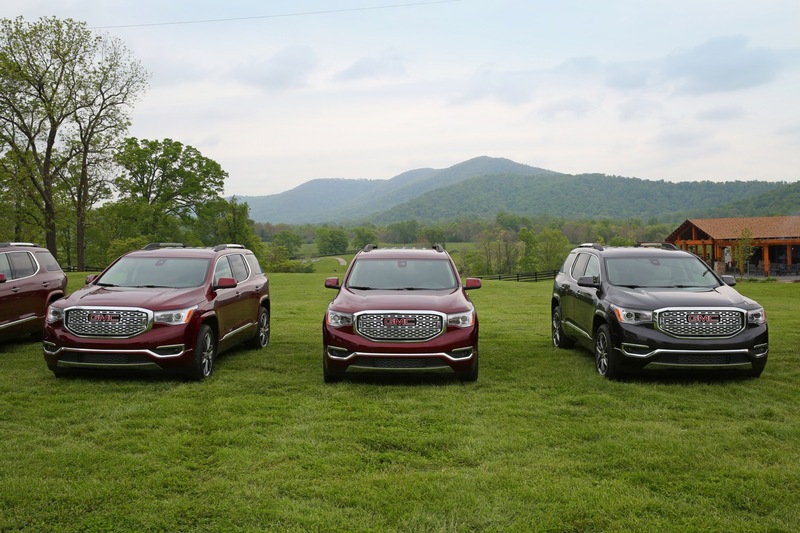 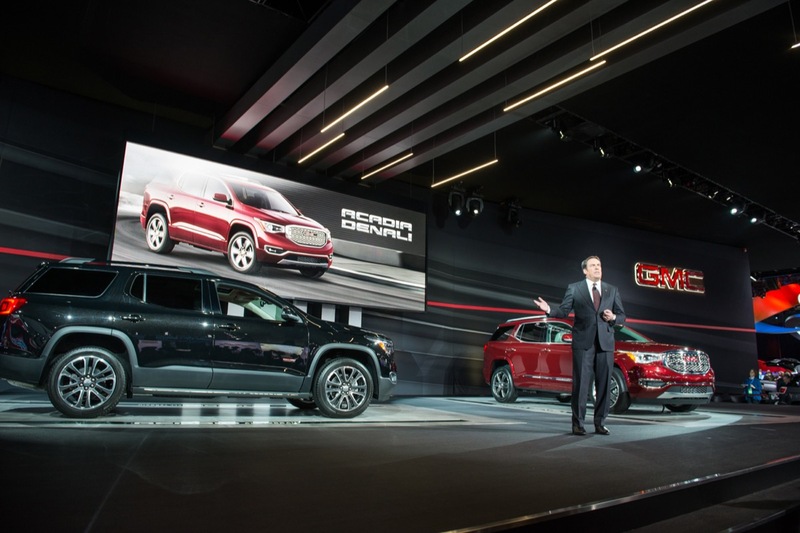 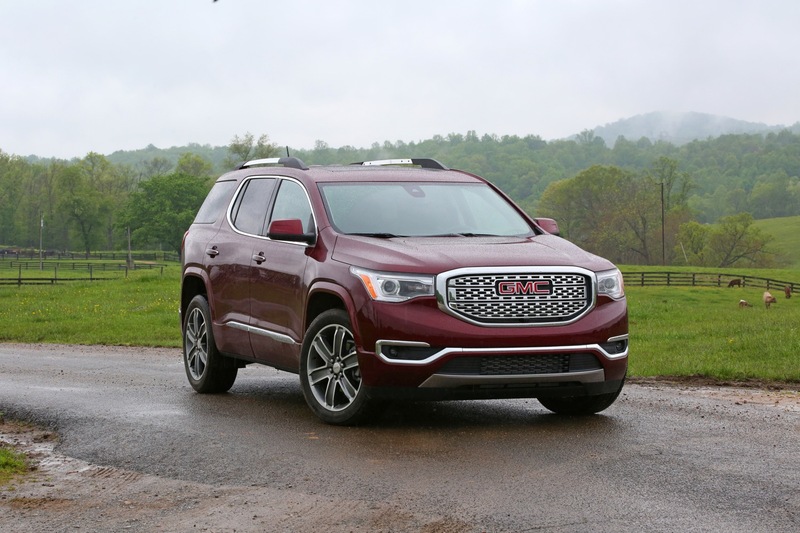 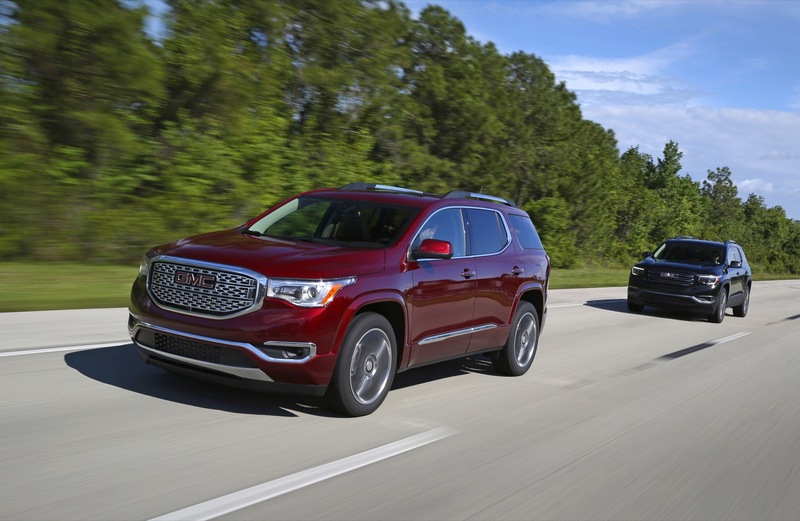 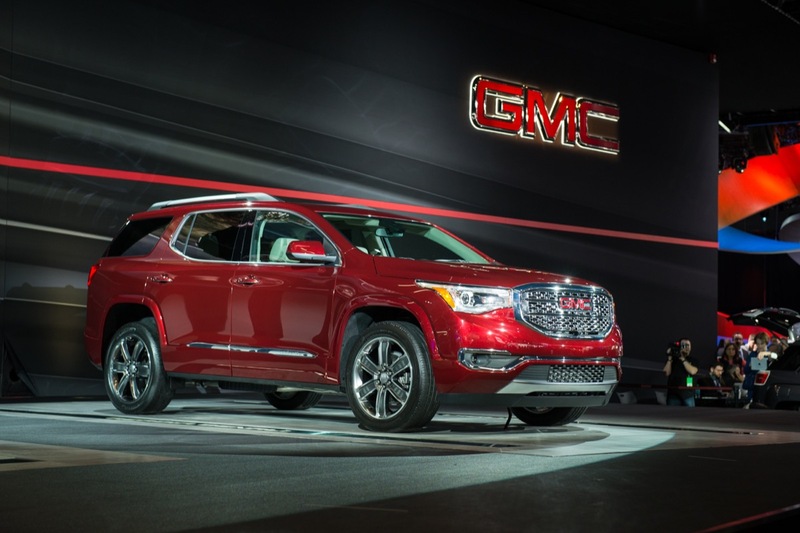 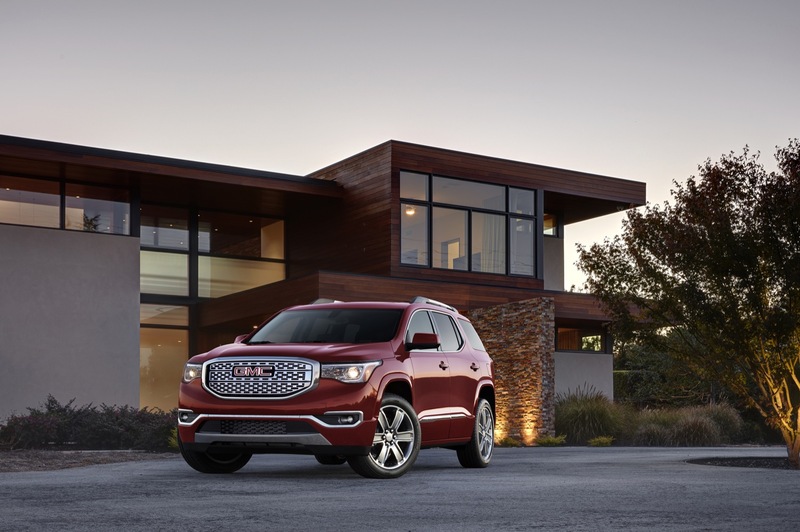 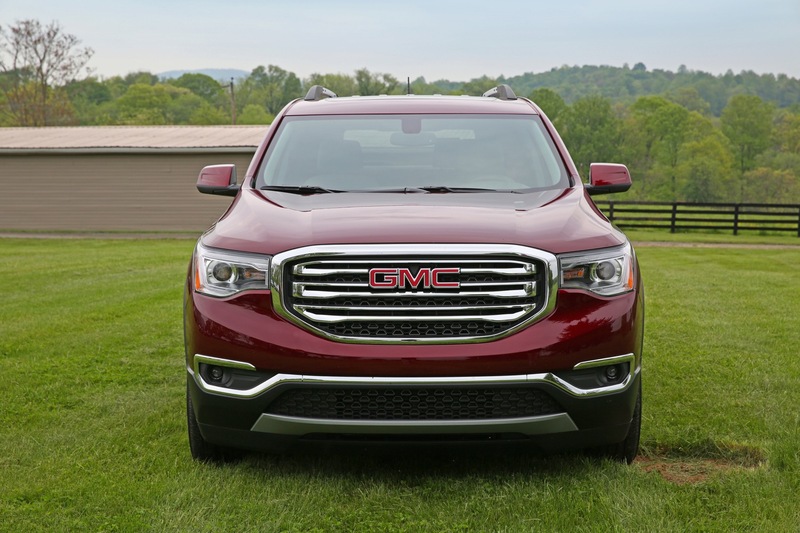 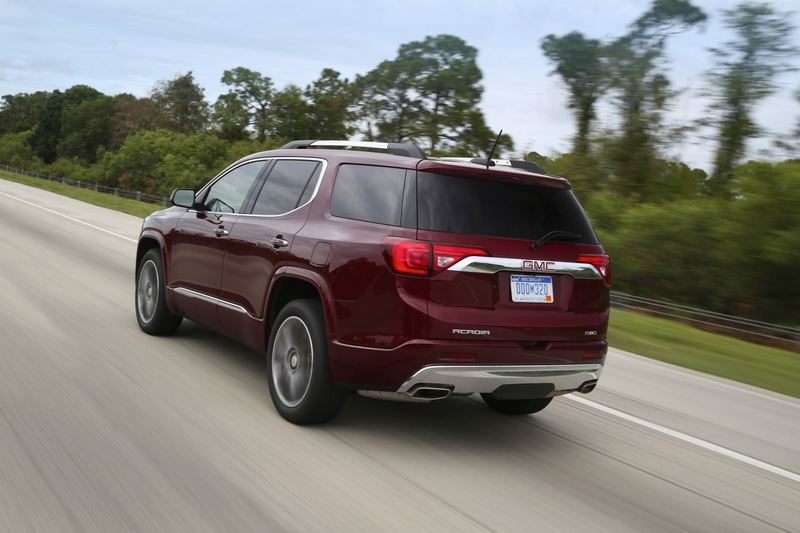 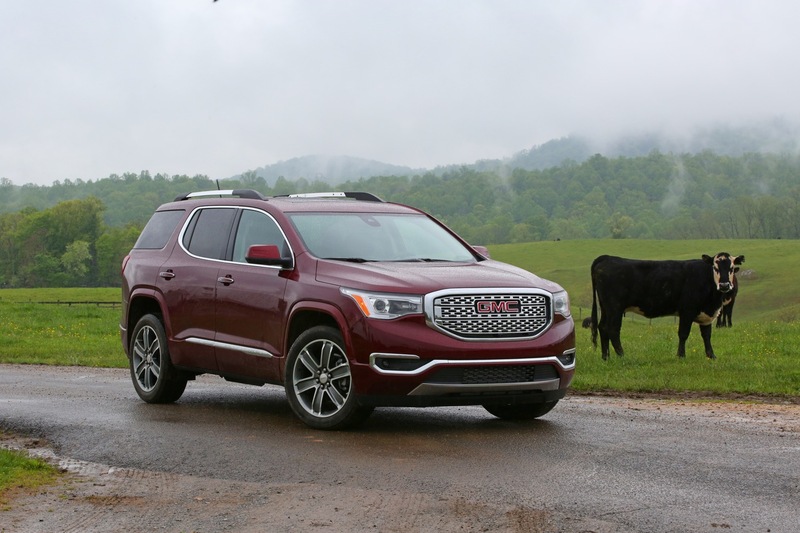 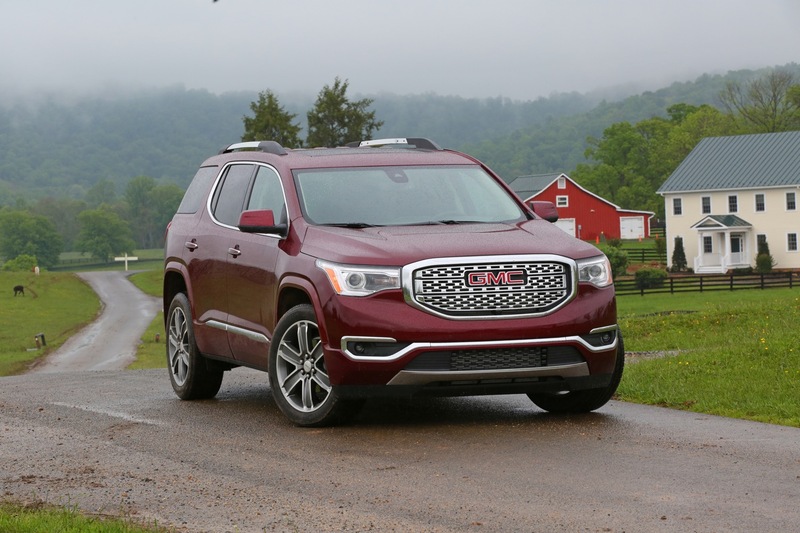 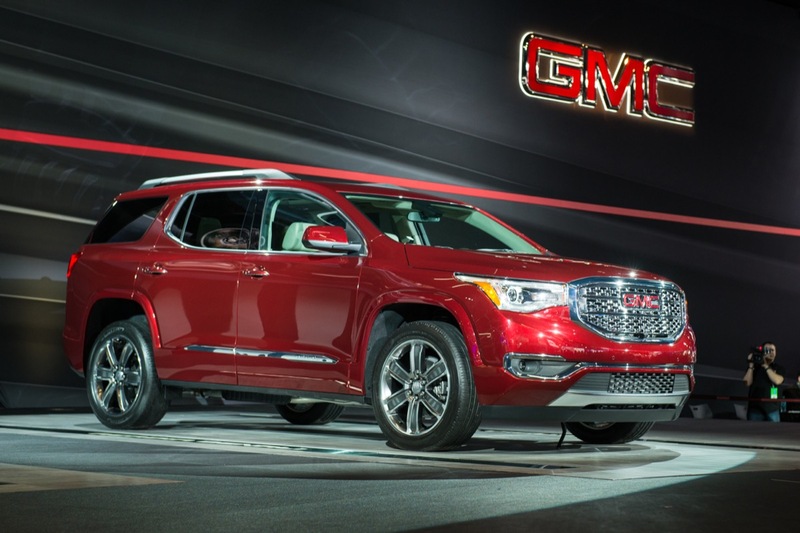 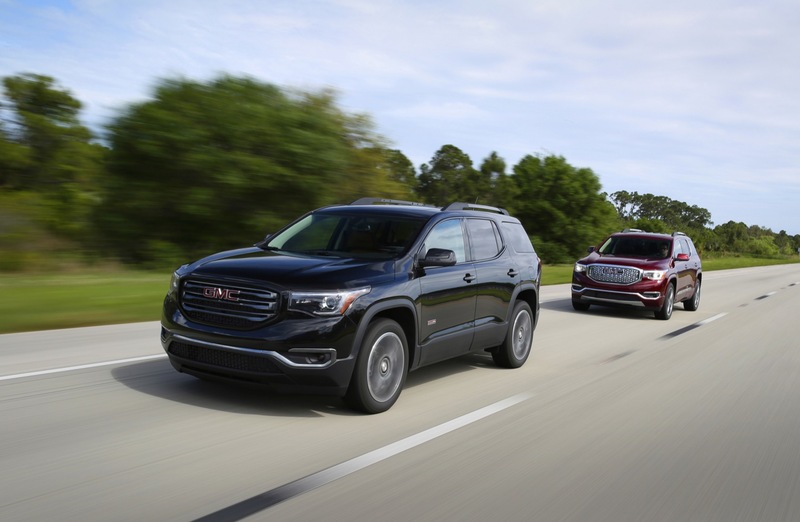 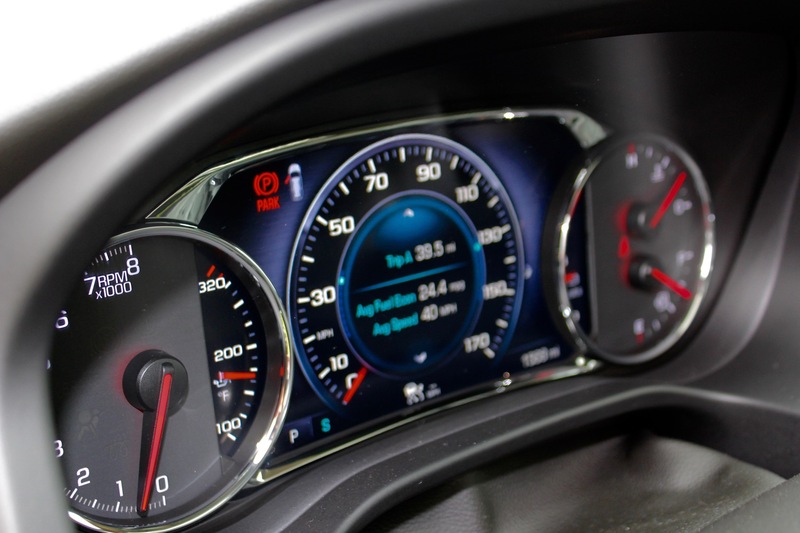 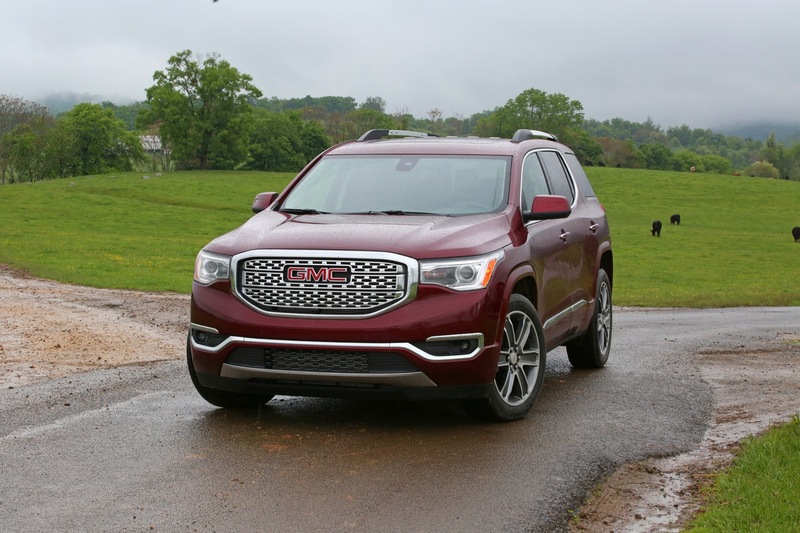 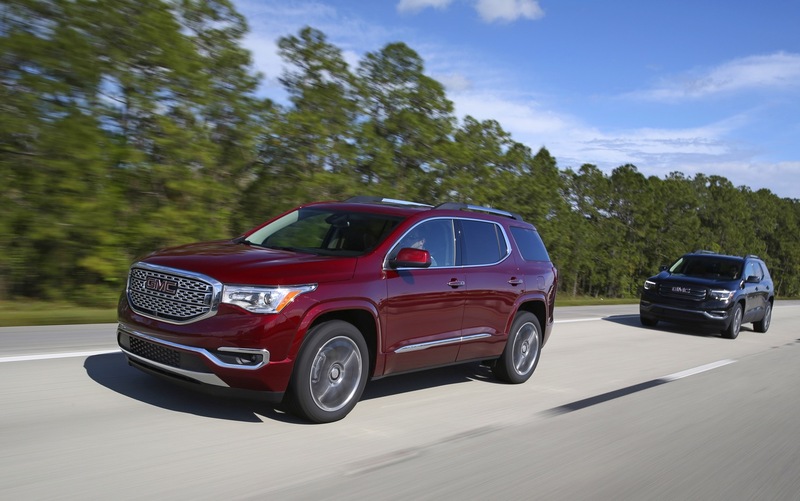 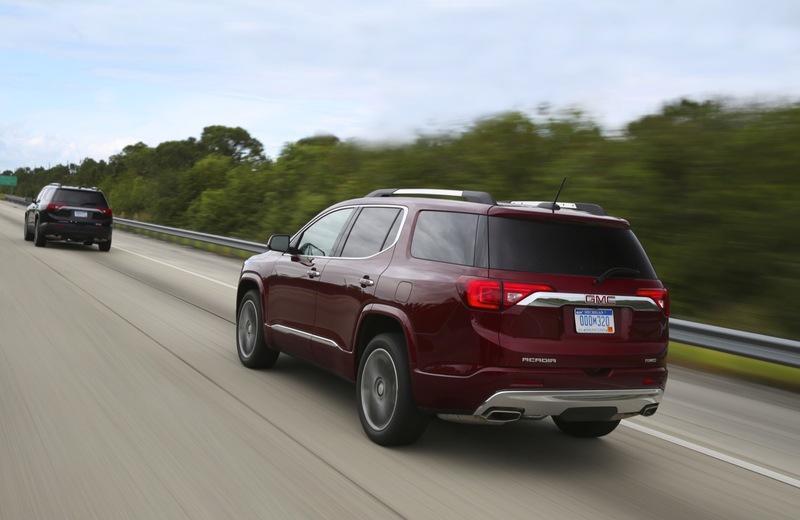 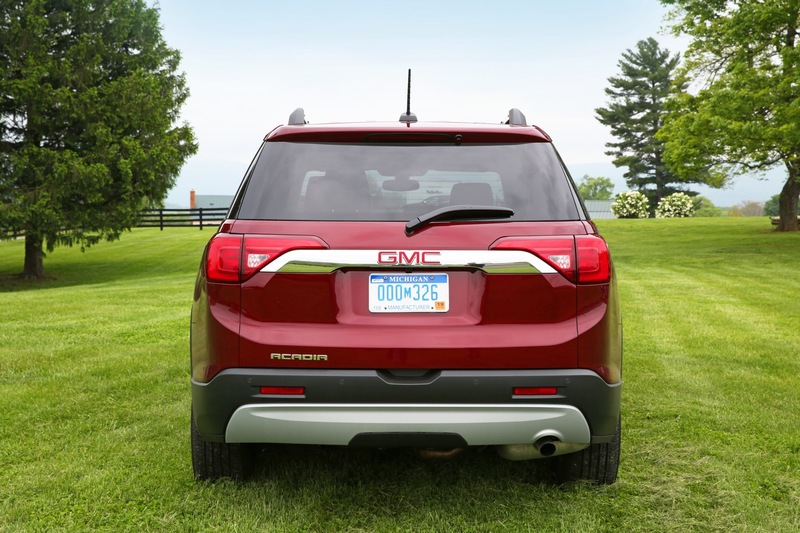 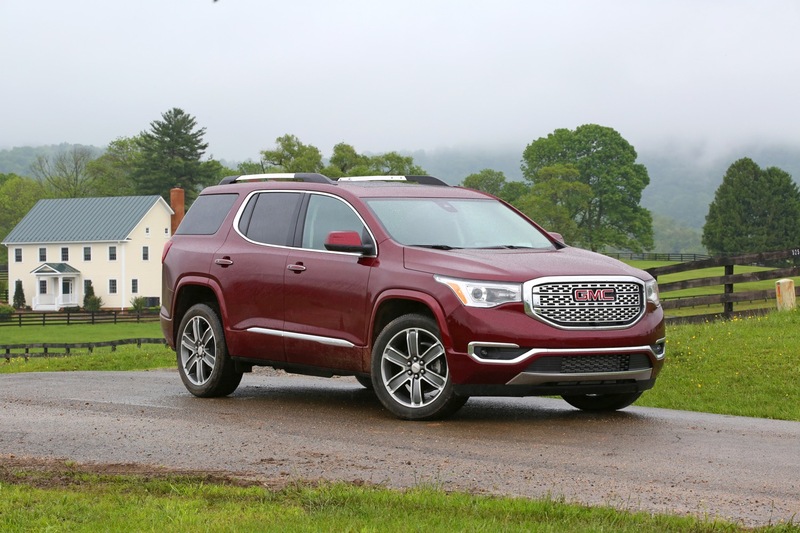 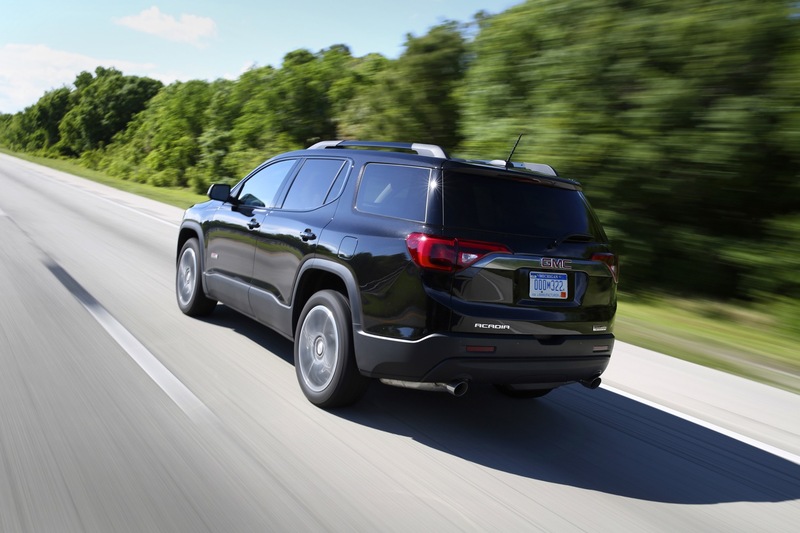 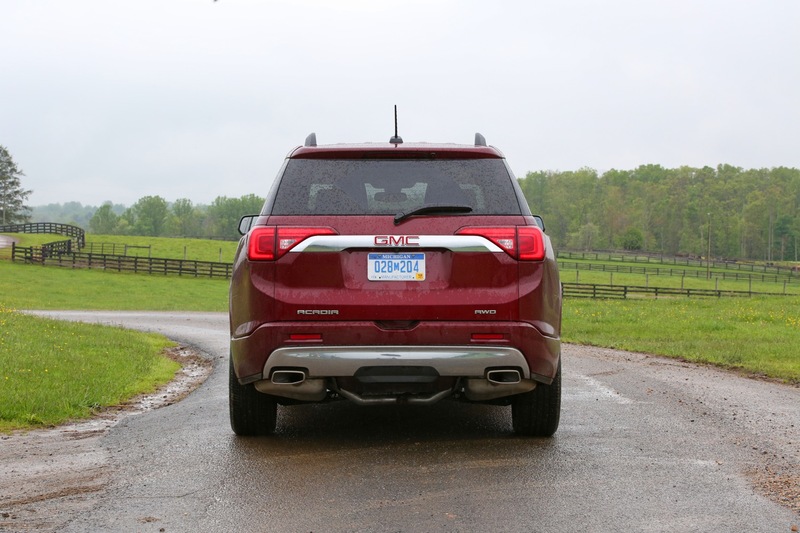 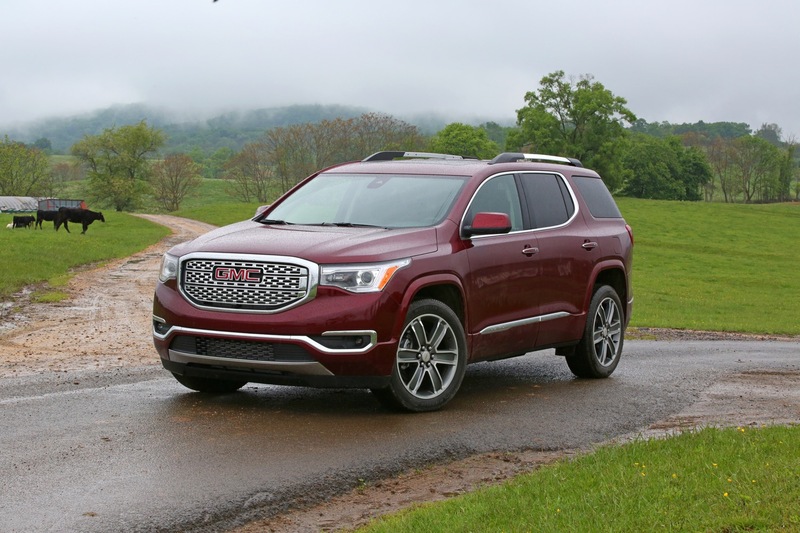 The redesigned 2017 GMC Acadia should offer better value, performance and fuel efficiency than vehicles like the 2016 Ford Explorer Limited which is over 4,400 lbs and price of $49,670. 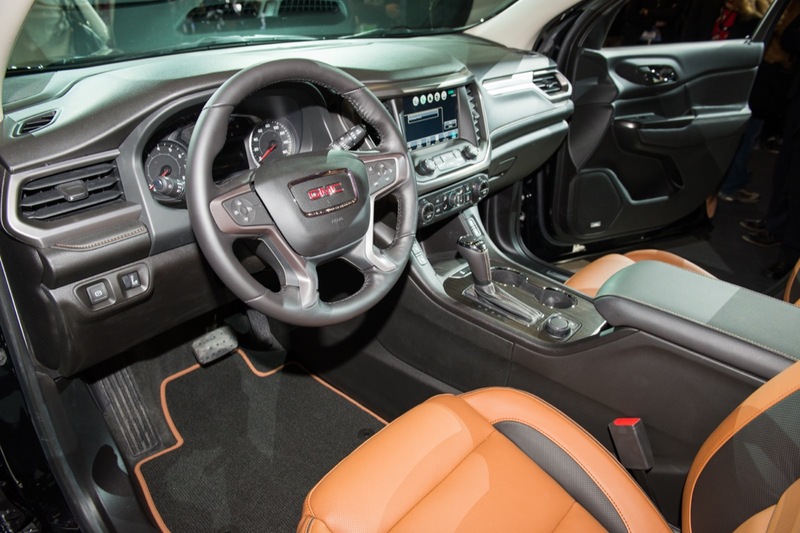 This new Acadia is very good looking on the outside, but the interior is pretty crappy looking and by crappy, I mean really really cheap. 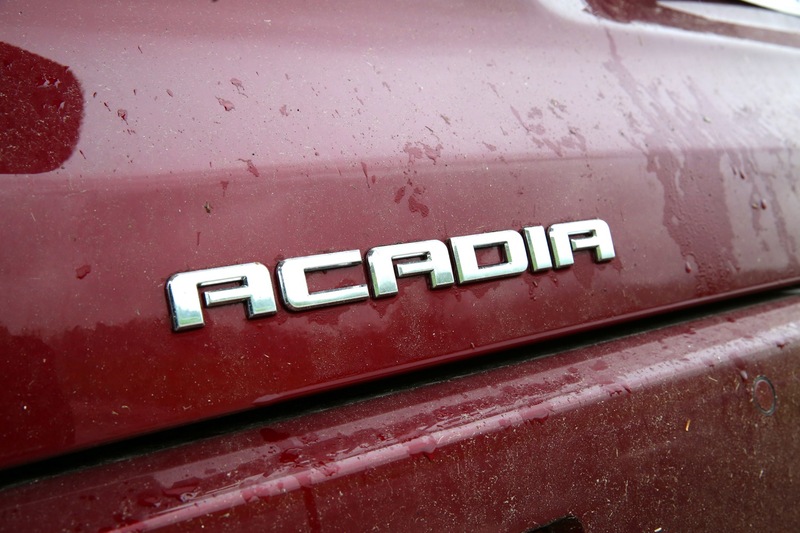 I think it’s a good package to offer , on the Sierra and now Acadia . 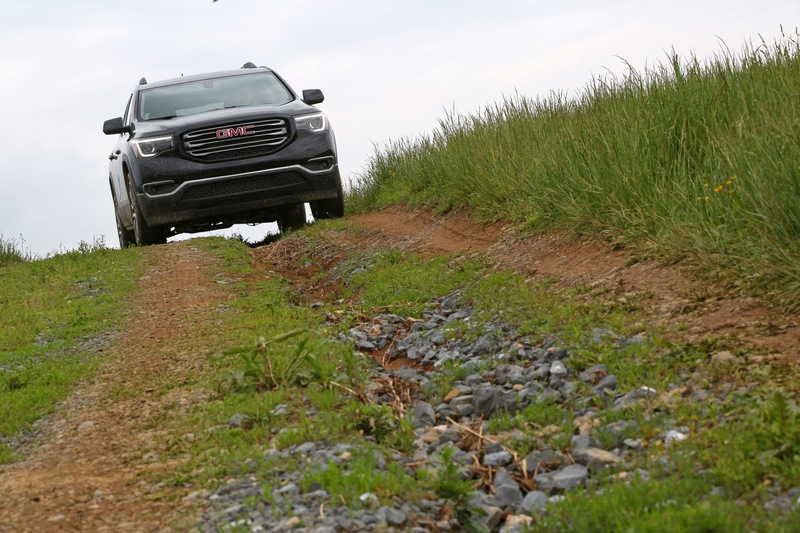 So if GMC wants to offer the ” All Terrain ” Pckg , on the new compact Terrain they need to change the name . 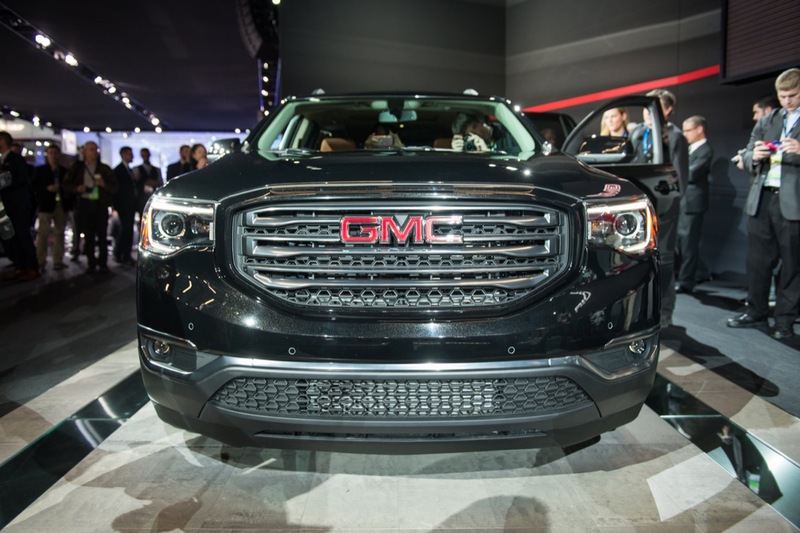 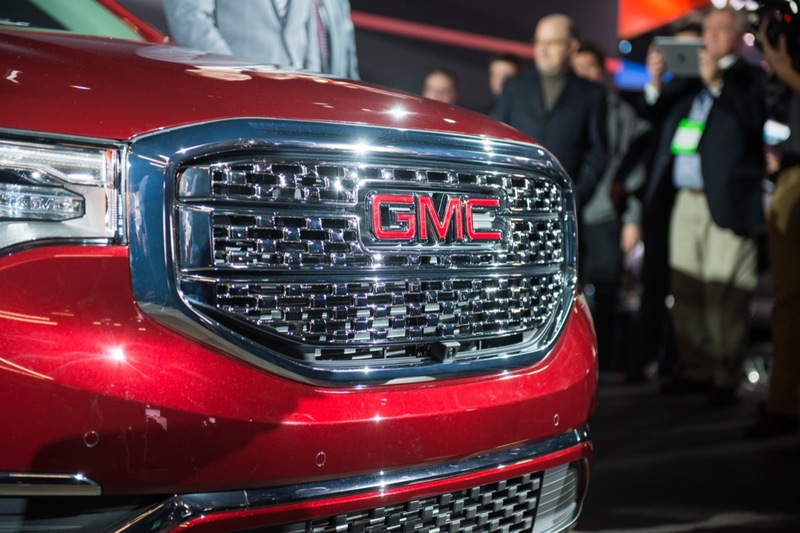 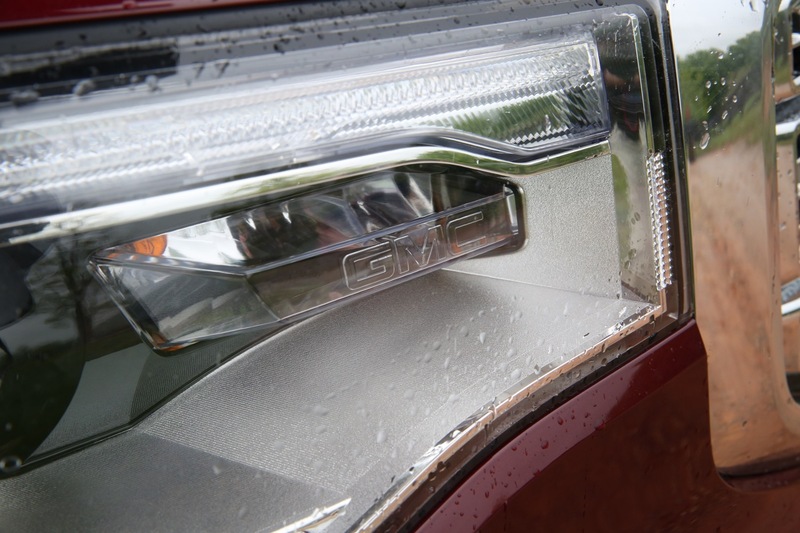 Could ” Graphyt ” be GMC’s all new compact SUV . 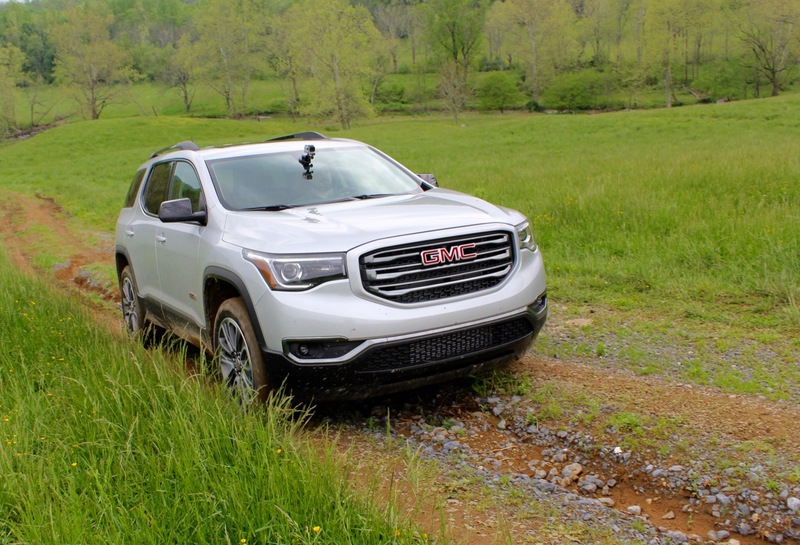 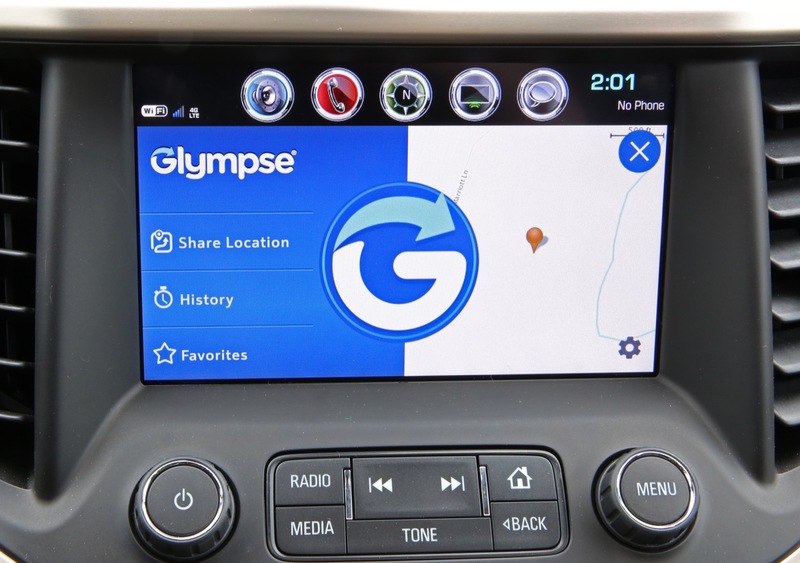 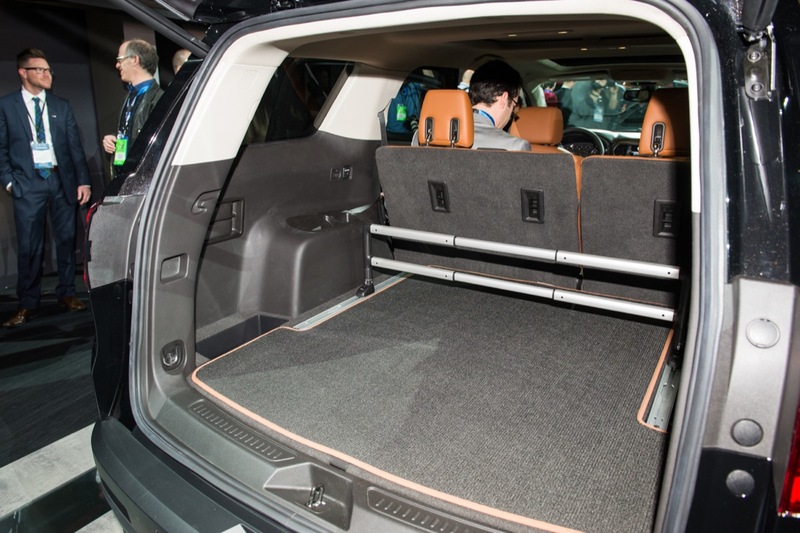 Graphyte will be the subcompact while the second-gen Terrain will go compact… so it will be interesting to see how the All Terrain package will be applied there. 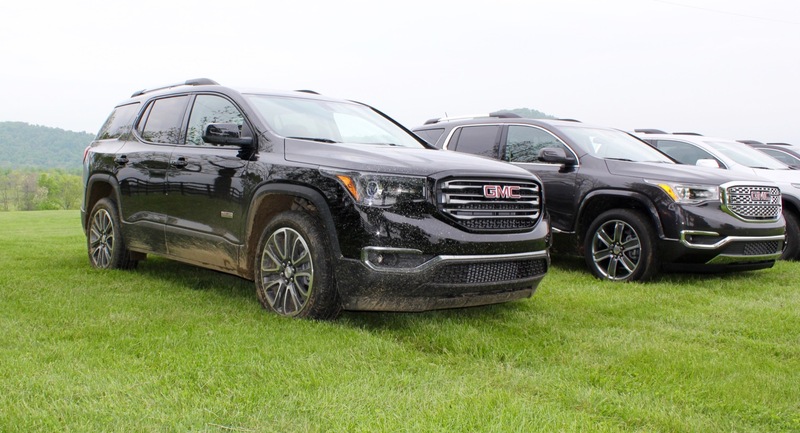 Perhaps that’s what the AT4/AT4X trademark filings are for. 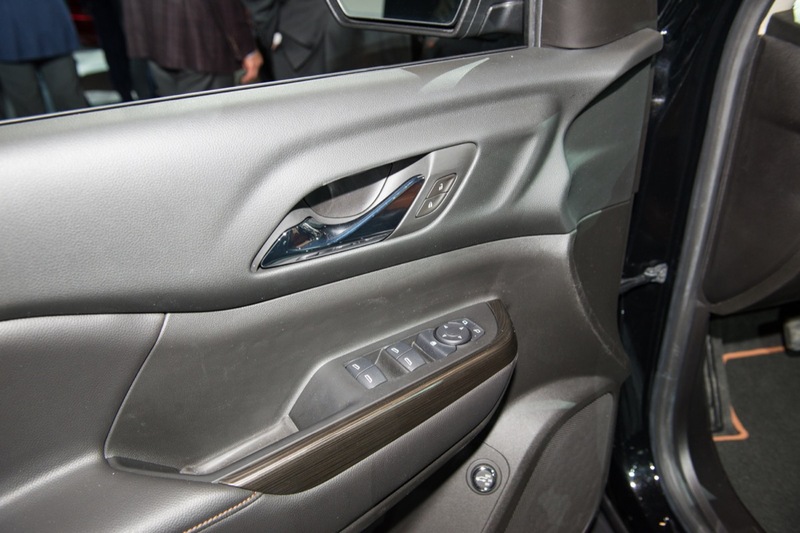 I really don’t like the bottom plastic cladding on the body of the vehicle. 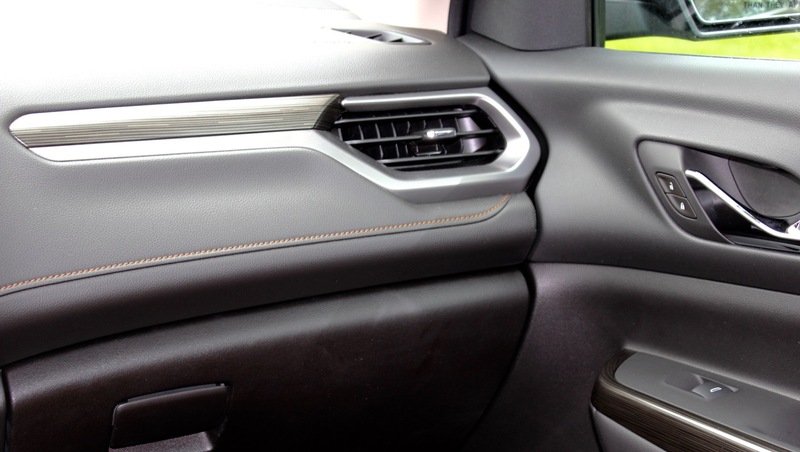 Didn’t plastic cladding go out of style many years ago? 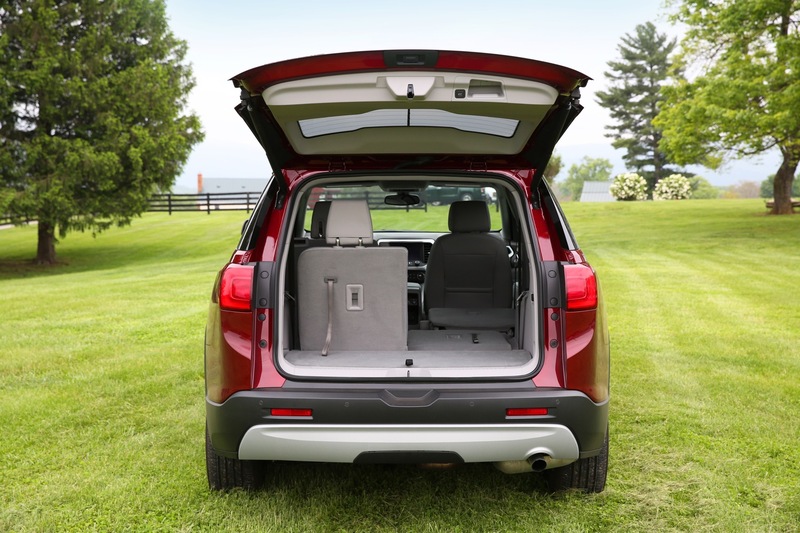 Also, the rear seat window doesn’t flow very well with the rear cargo window. 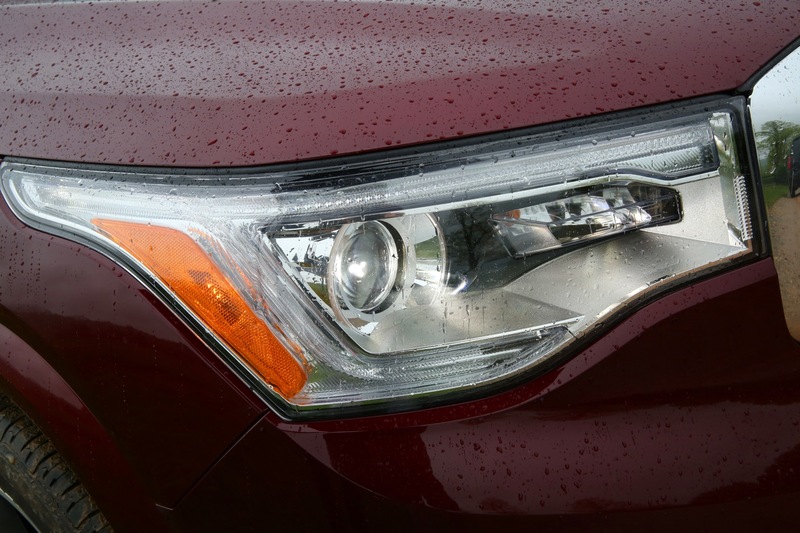 Loved the cladding on my ’03 and ’04 Avalanche. 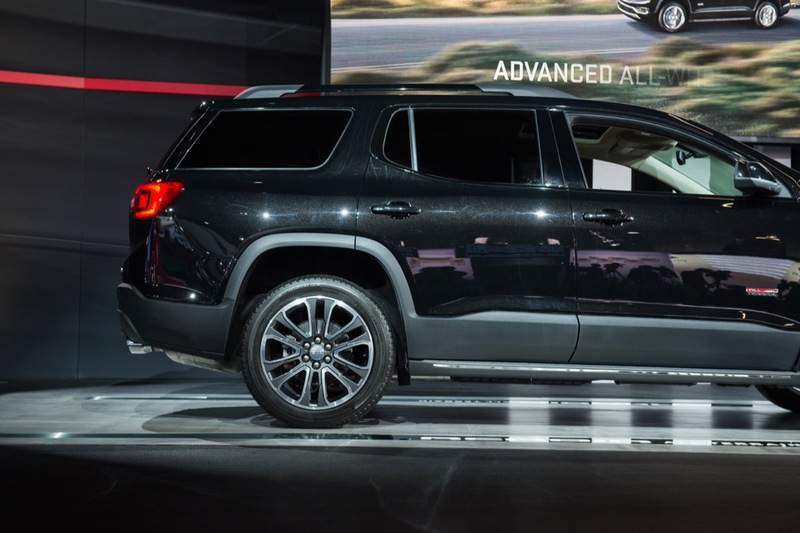 And the cladded versions had a superior front end to the non cladded ones. 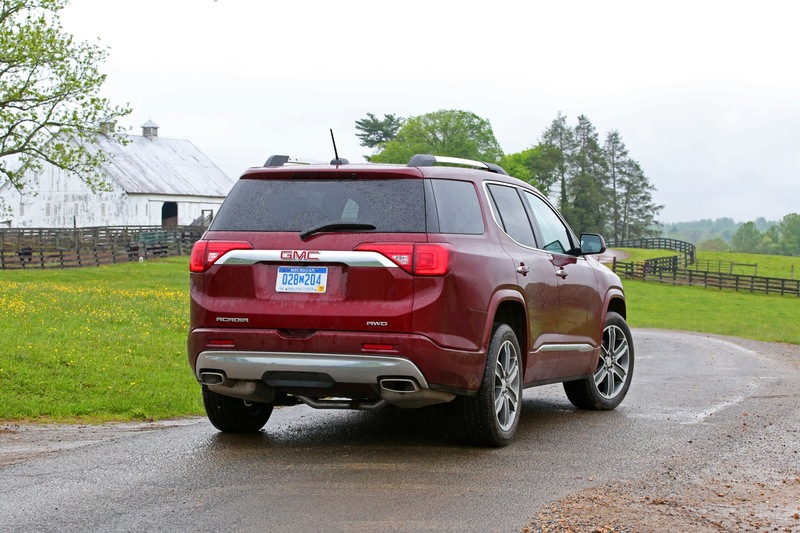 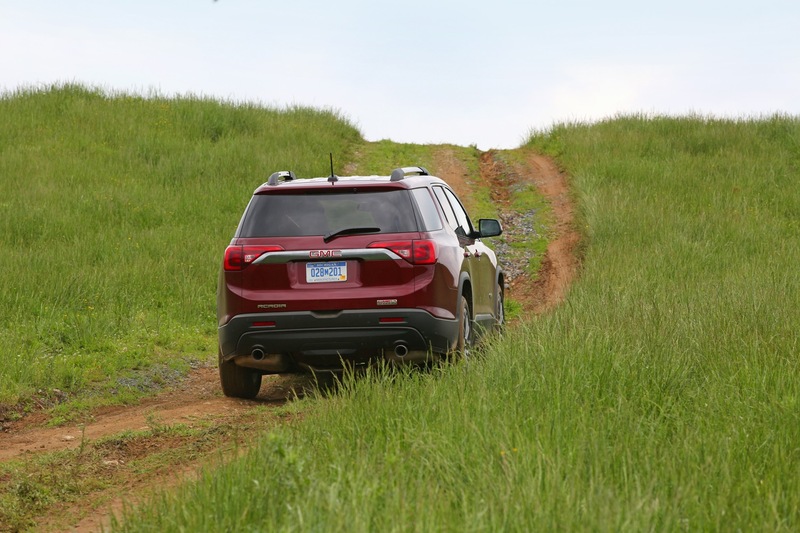 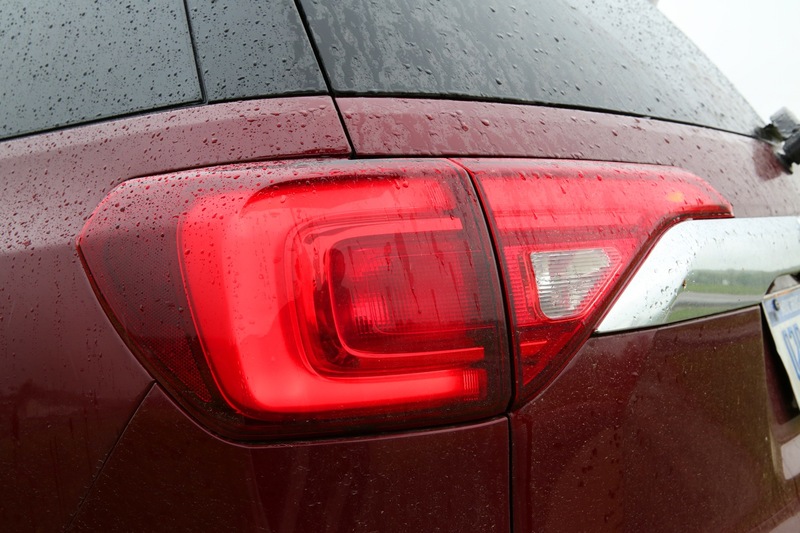 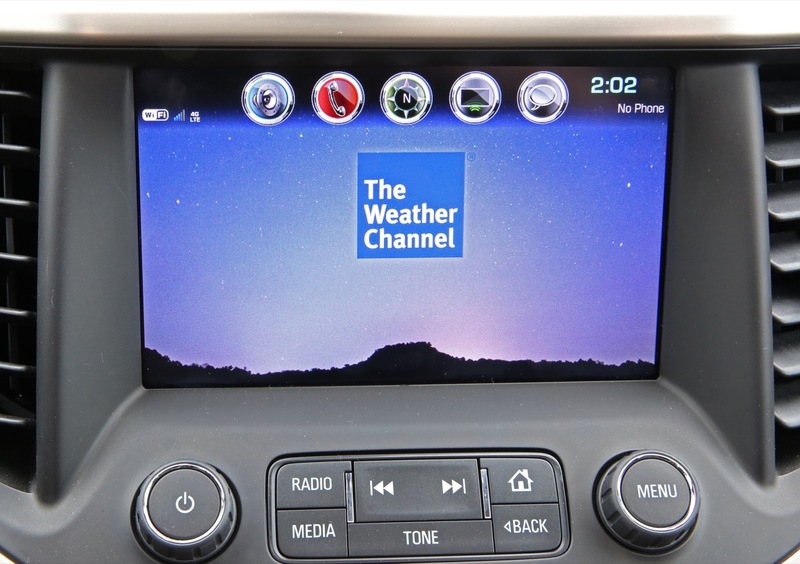 It’s really the only thing that makes this Acadia “all terrain” over any other AWD Acadia. 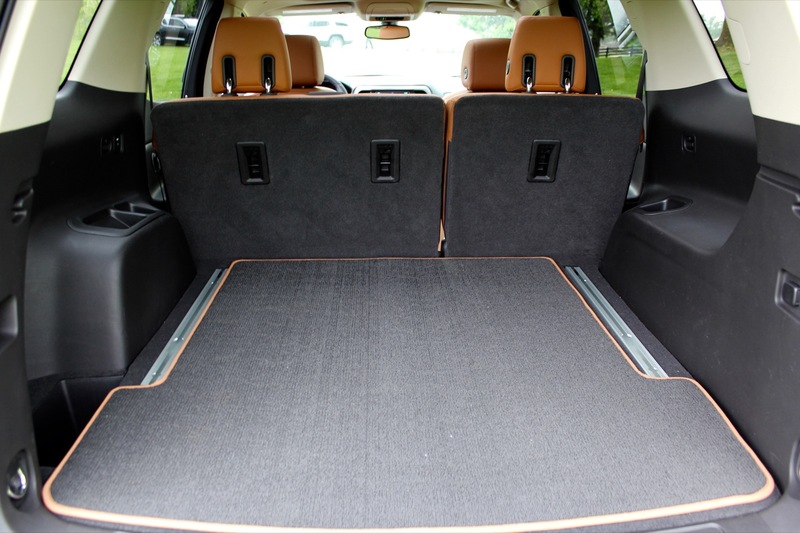 Lower body cladding prevents the bottom part from scrapes on the paint from the bushes, and rock chips on the lower panels and the edges of the wheel wells. 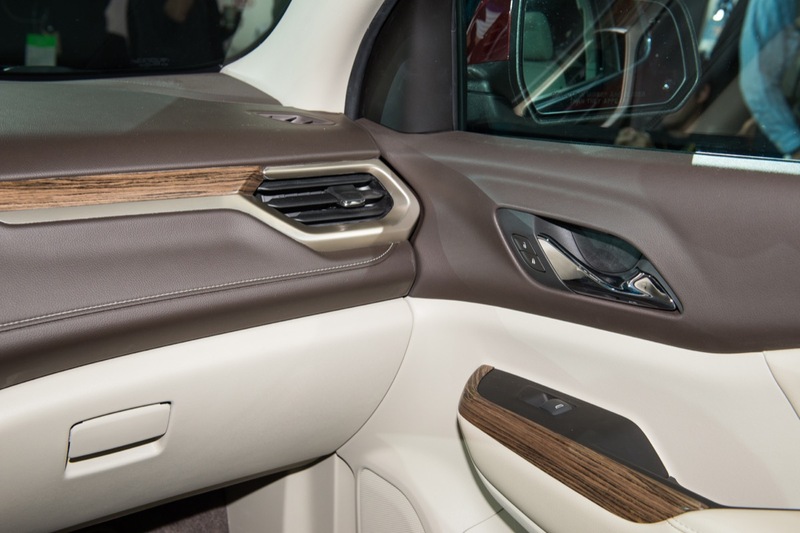 But yeah, hasn’t been an option for cladding like this since the 2007 Avalanche dropped it all together. 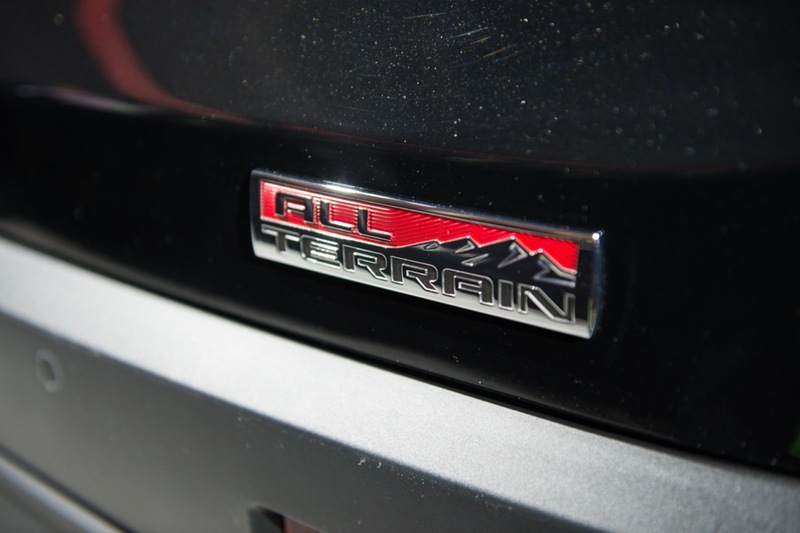 Call me old fashioned, but “All Terrian” should have different suspension, the ride height altered higher for better clearance, All Terrian tires (or close to)…similar to a Z71 package really, Some exclusive roof rails don’t make it any more “All Terrain”. 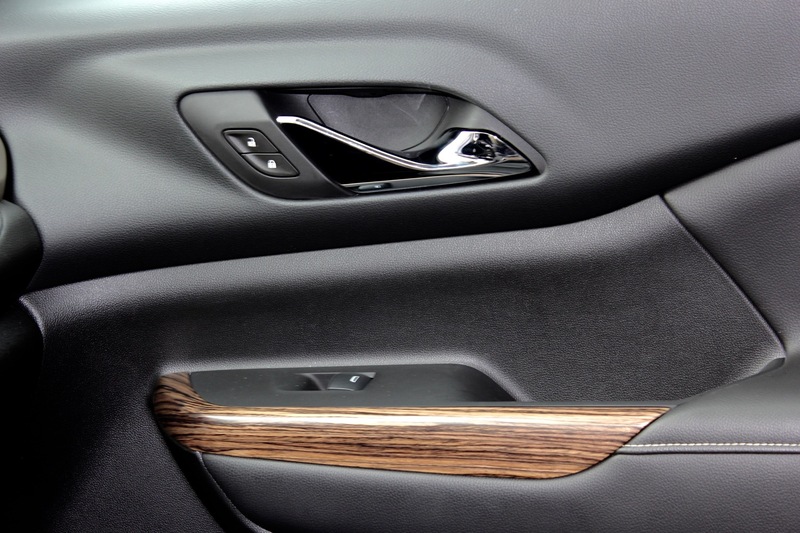 Again, at least the cladding gives it some potential extra function to go a bit off the beaten track…but not much. 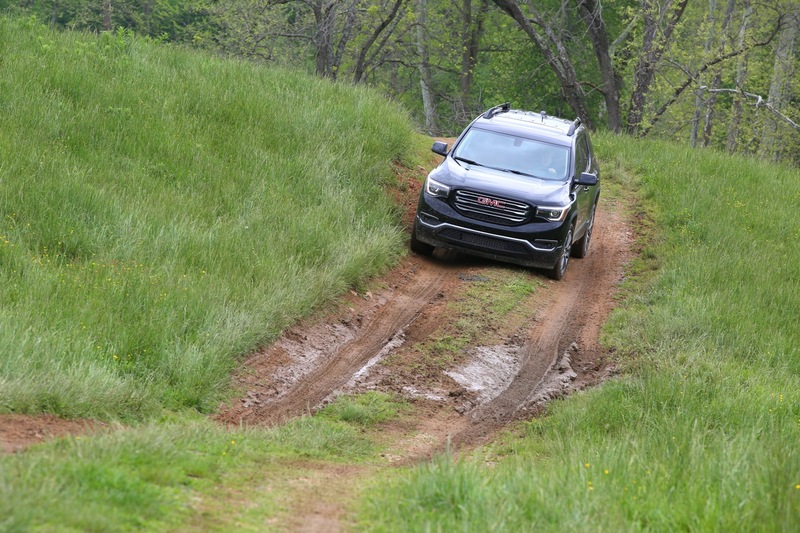 Serious potential buyer here, trying to configure a 2018 Acadia with the All Terrain package. 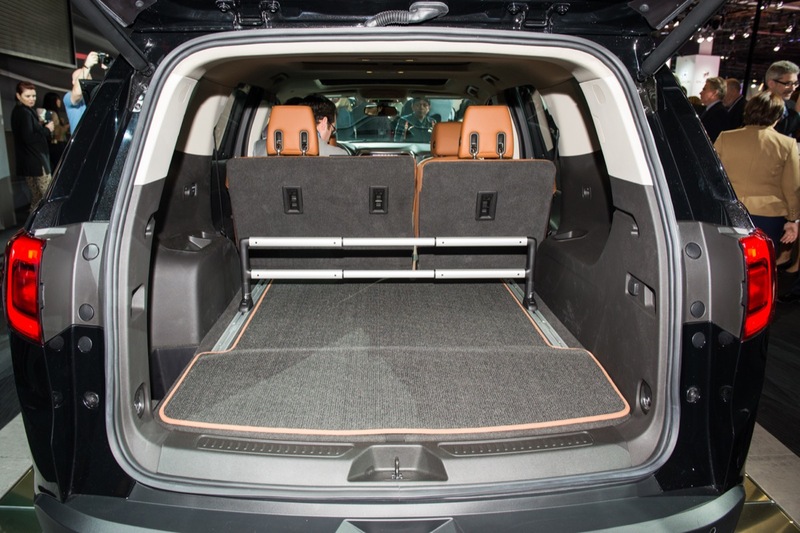 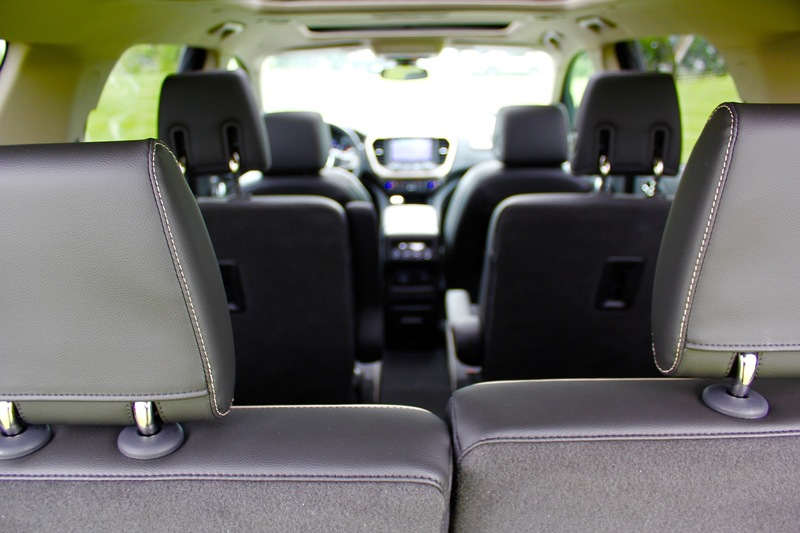 I like the added all-road capability, and very much prefer the 5-seat configuration. 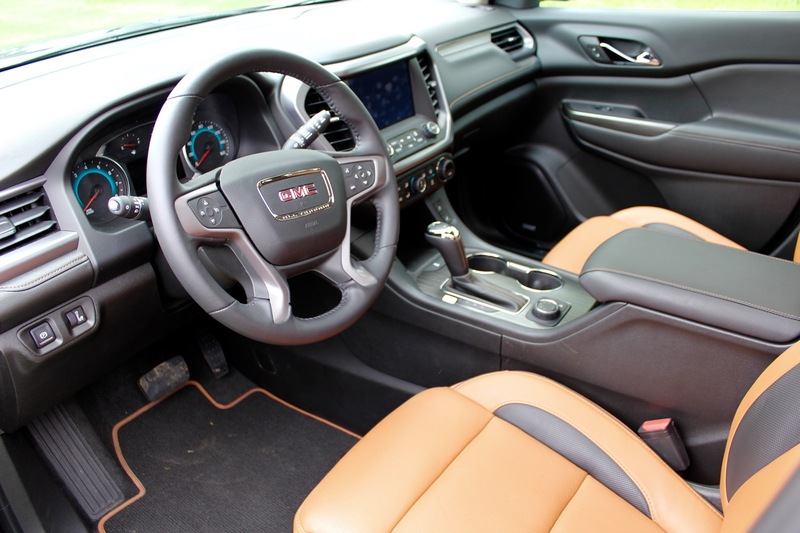 However, the only interior colors I can configure with the All Terrain package are the SLE-2 with plain black cloth seats, or SLT-1 in Jet Black/ Kalahari. 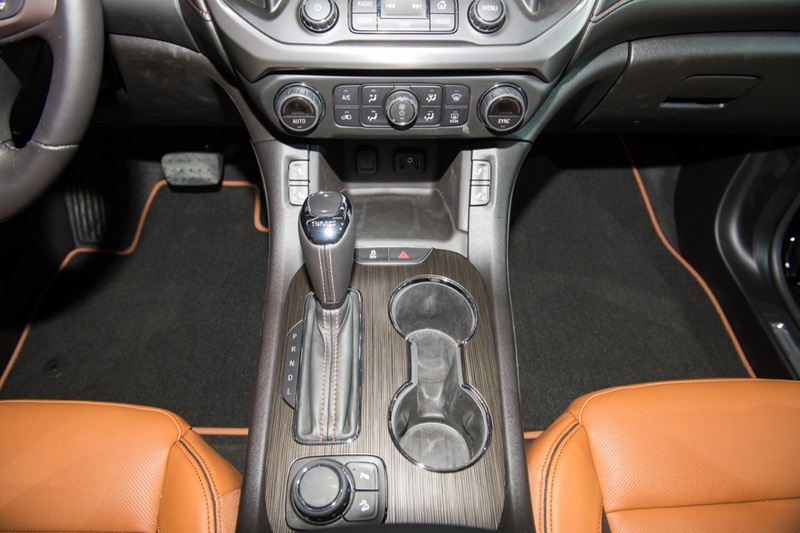 Not a fan of basketball orange leather or cloth seats, and this is putting me off the purchase. 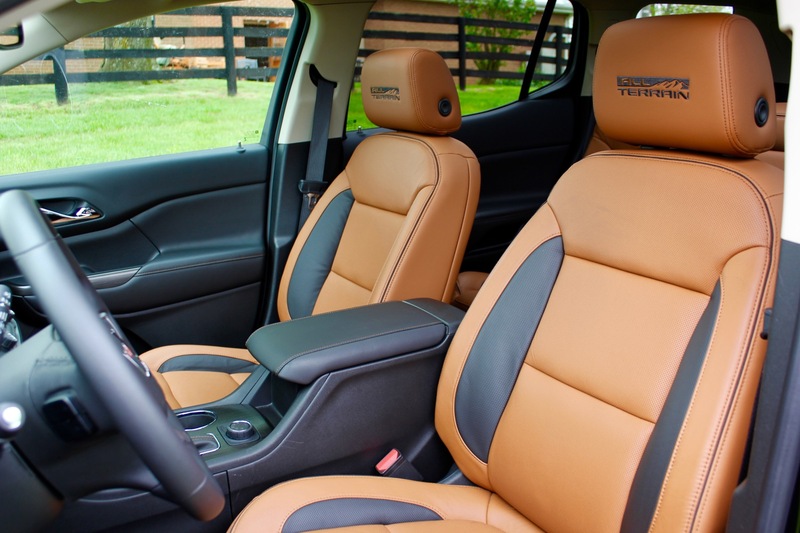 What happened to the creme leather interior as pictured above? 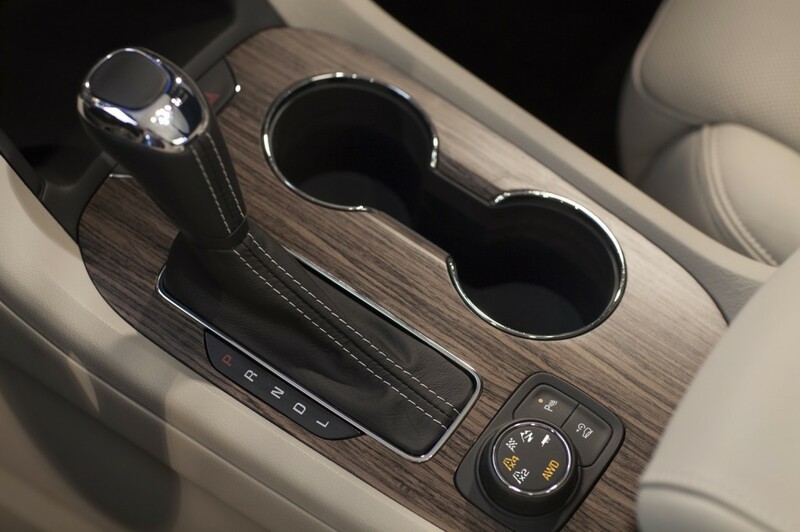 I want that. 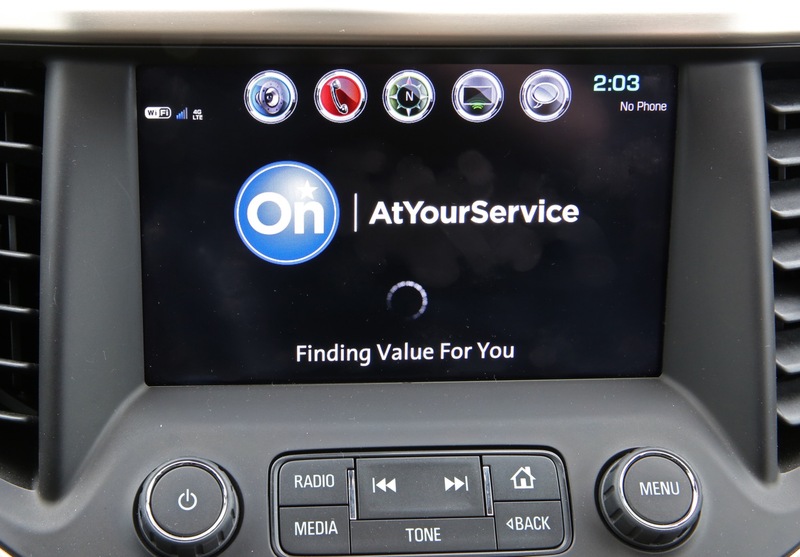 I was trying to do exactly what you are, configuring a 2018, seems like something in the websites vehicle builder isn’t working quite right for the 2018 models. 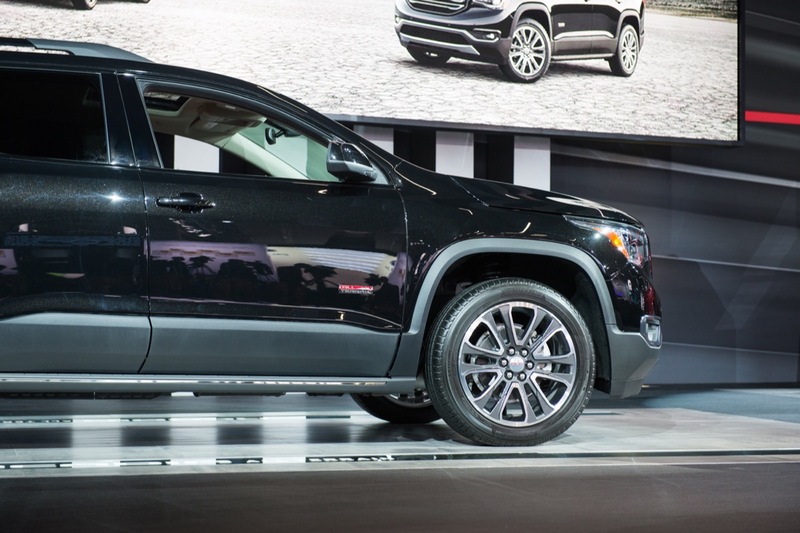 Try configuring a 2017 with the options you want, I don’t think anything changed from ’17 to ’18. 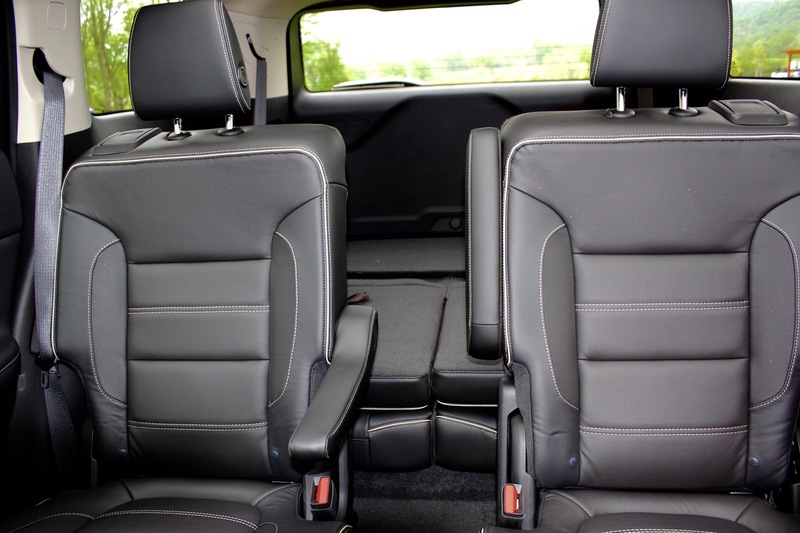 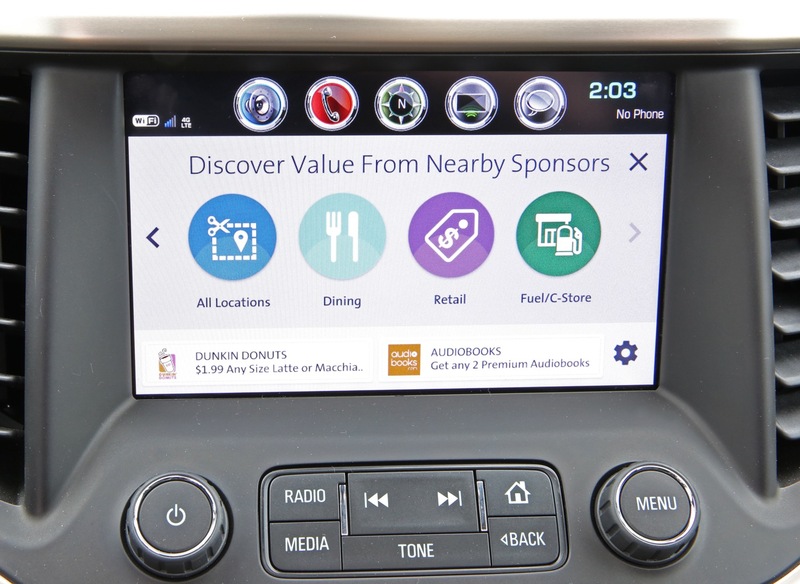 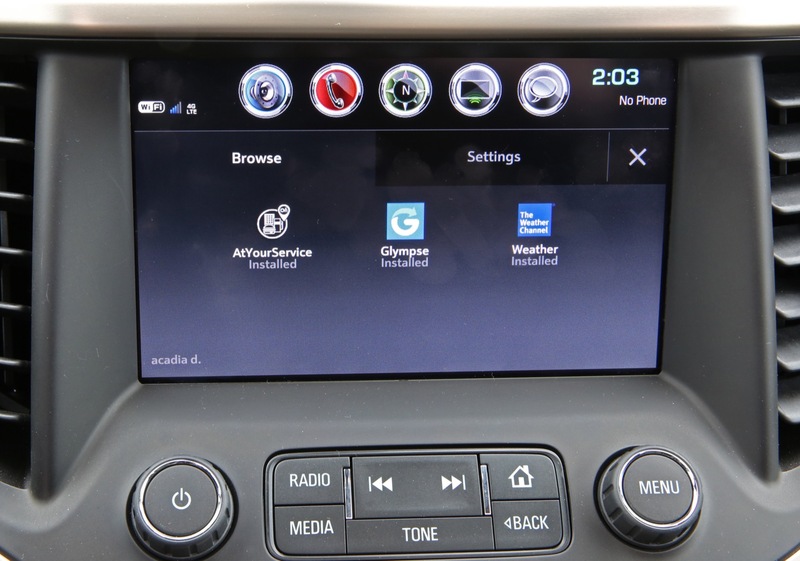 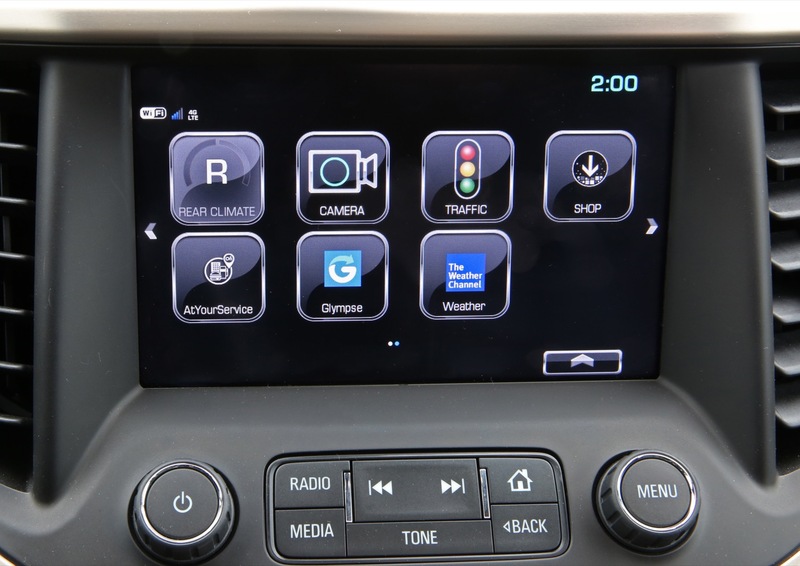 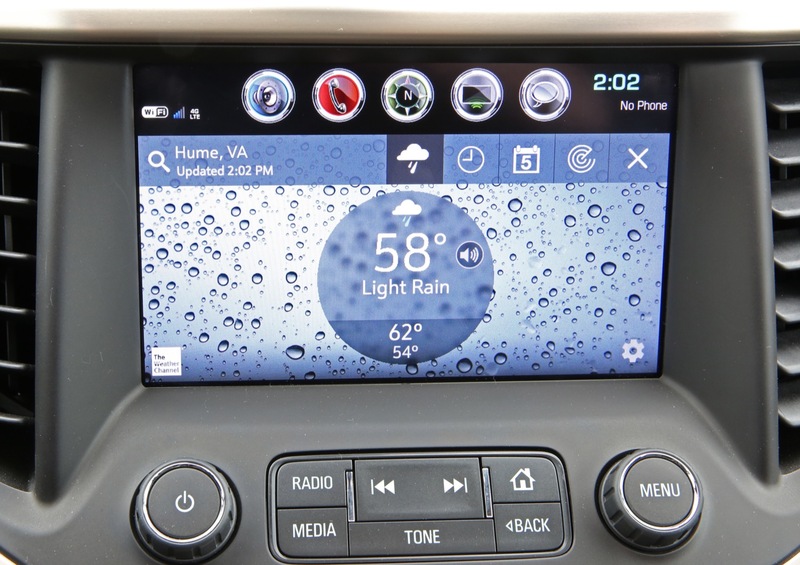 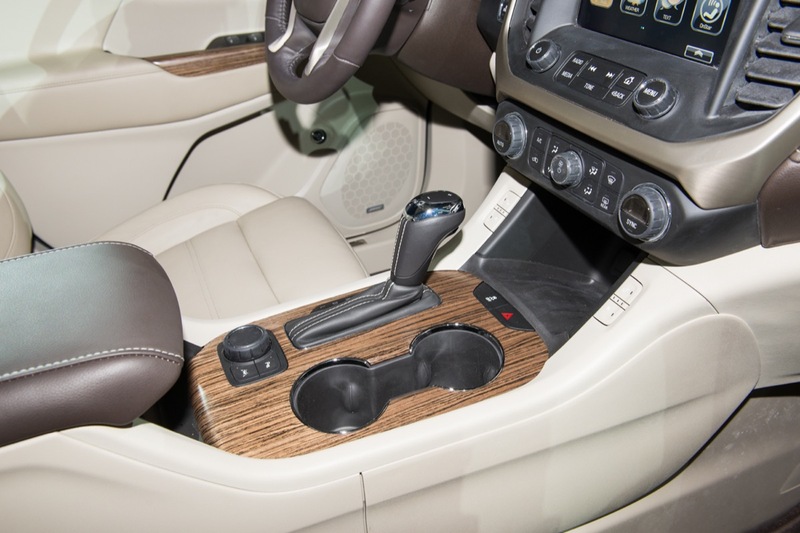 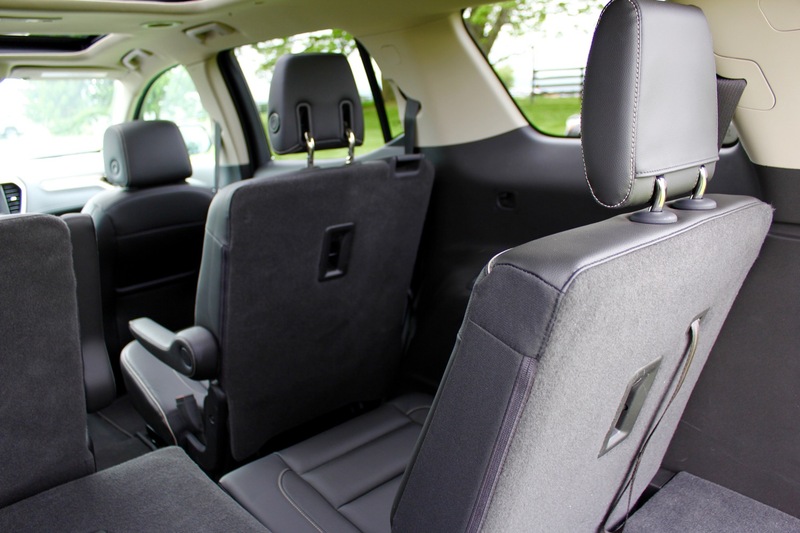 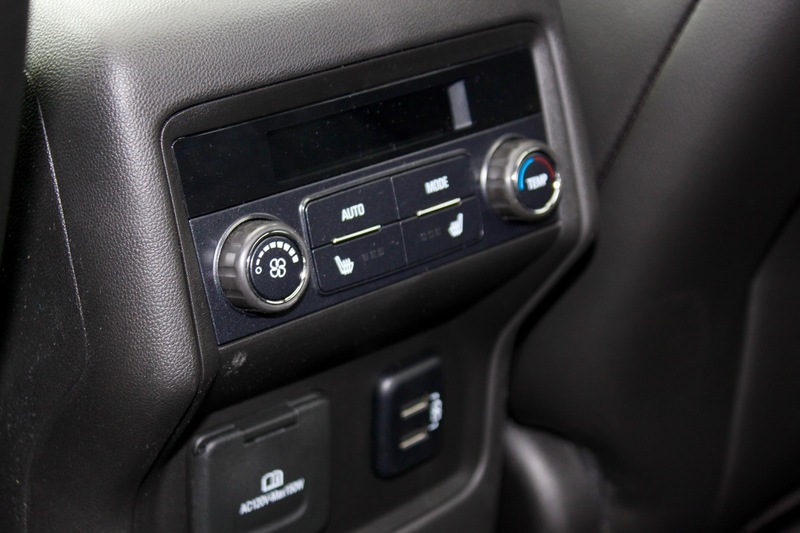 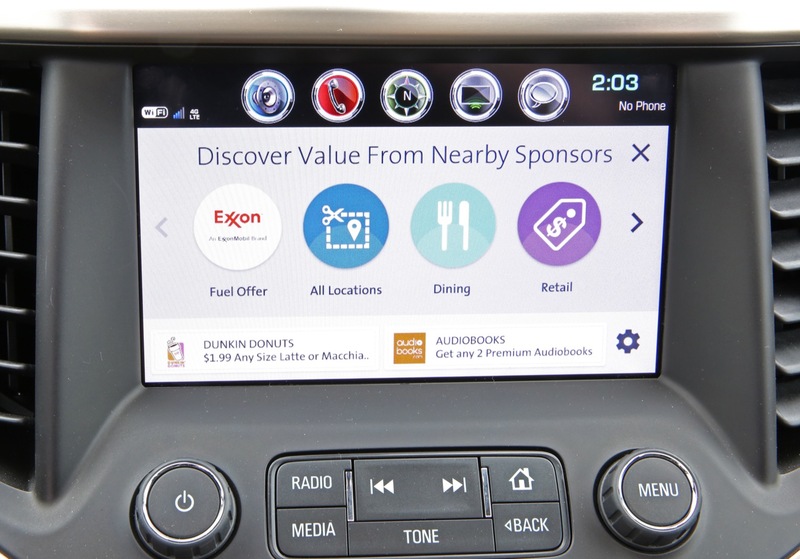 Also, the only interior options for the All Terrain package are the ones that you mentioned. 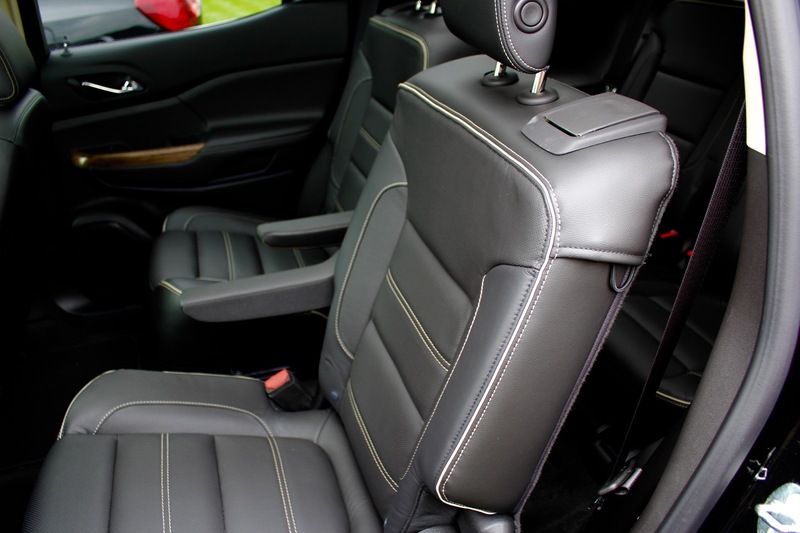 If you want a different seat color you would have to select a different package. 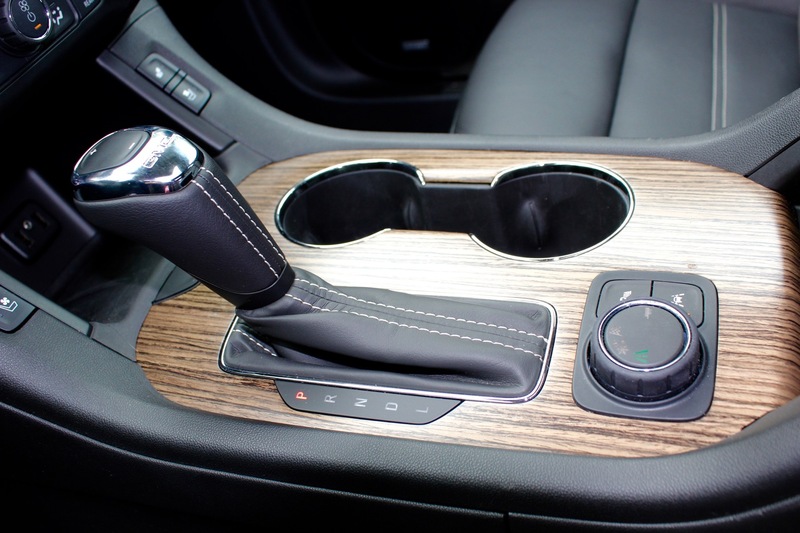 The Kalahari interior was why I purchased it along with NO CHROME – I hate chrome. 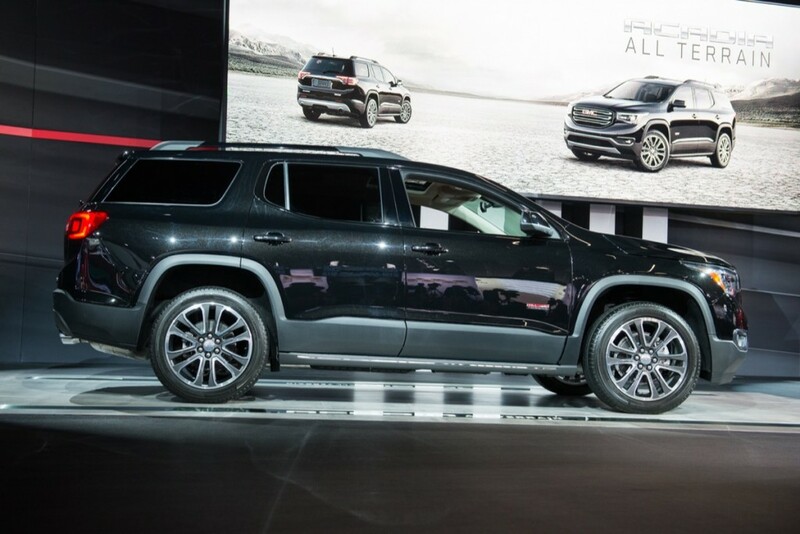 I love the edgy look of the entire package.